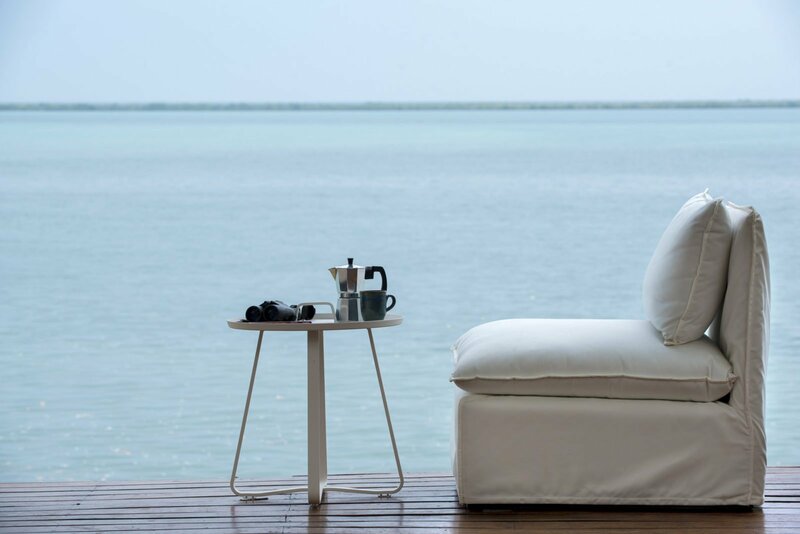 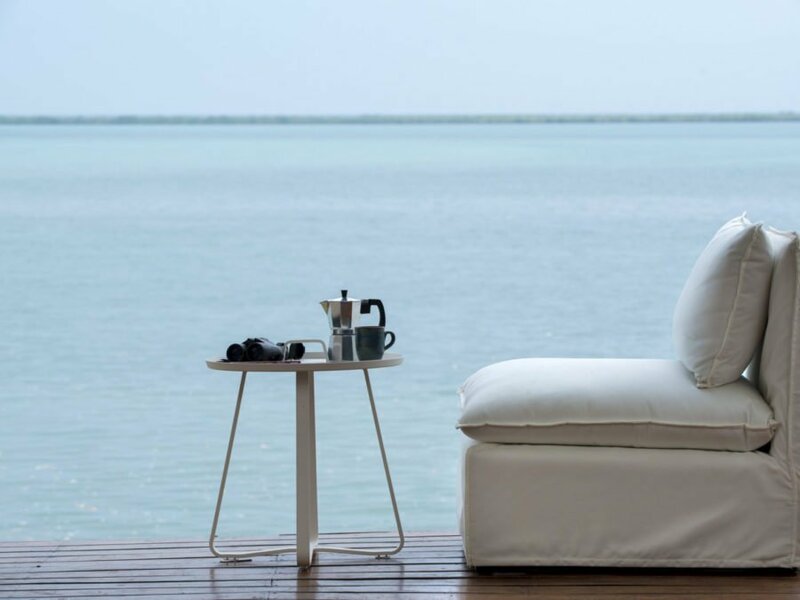 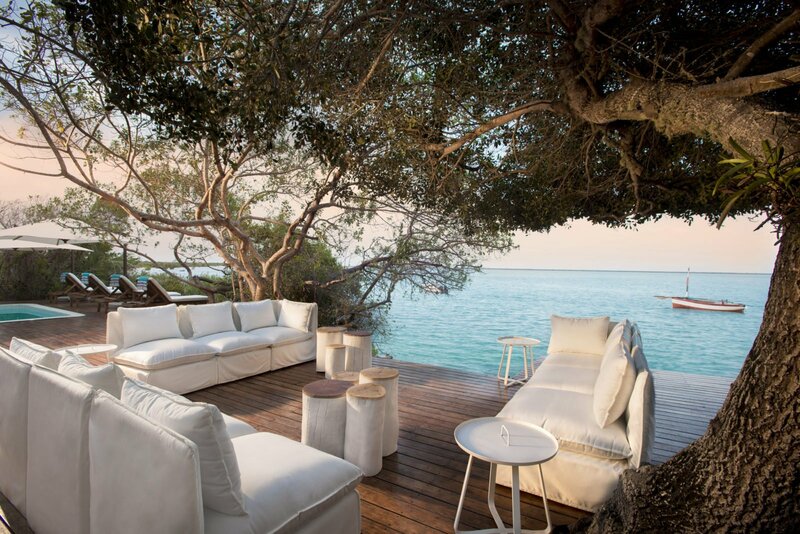 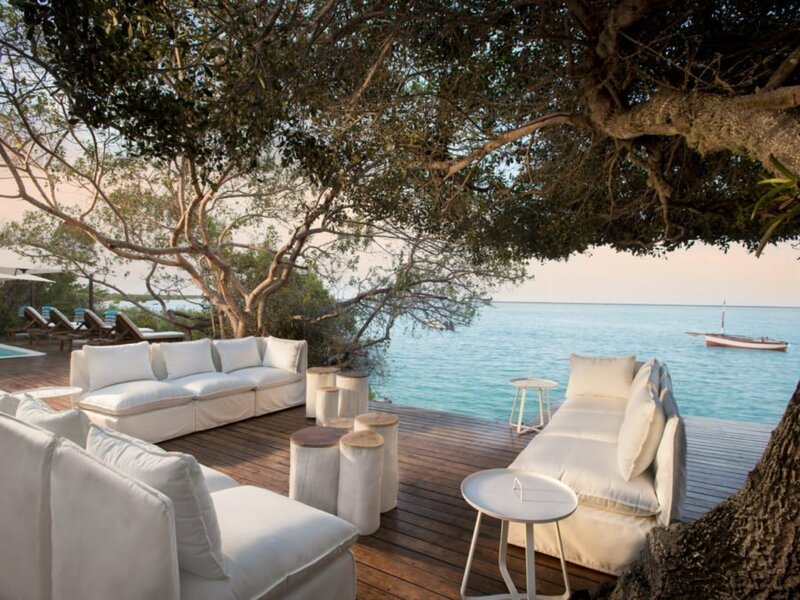 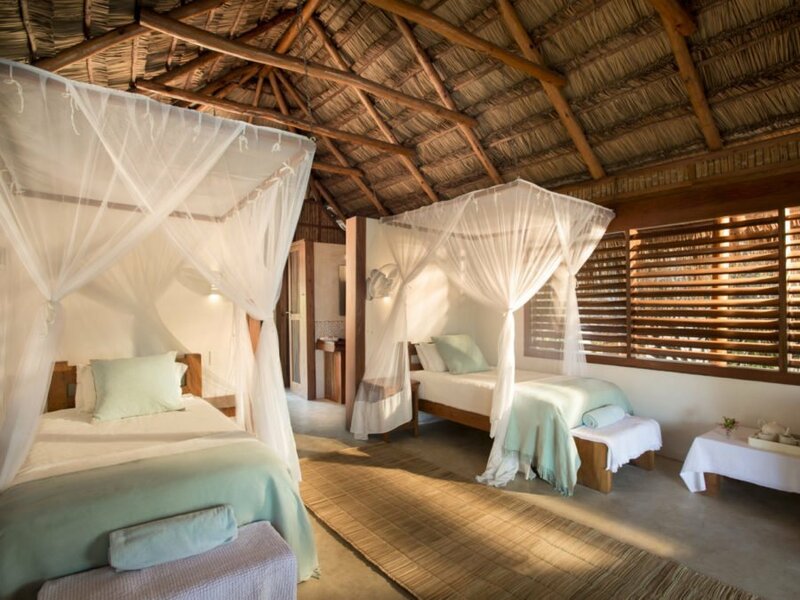 Escape to paradise and experience the blue waters and pristine shores of Mozambique at Rio Azul, a new eco-lodge overlooking a blue tidal lagoon that is home to a distinctive ecosystem with access to the warm Indian Ocean. 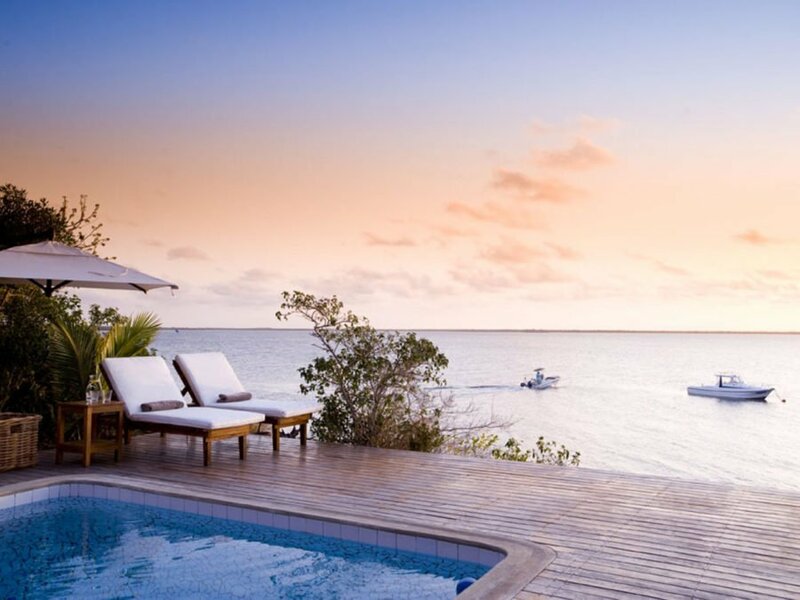 Surrounded by a magnificent mangrove forest that the lodge is dedicated to protecting, it’s the perfect setting for travellers with a love of nature and a taste for adventure. 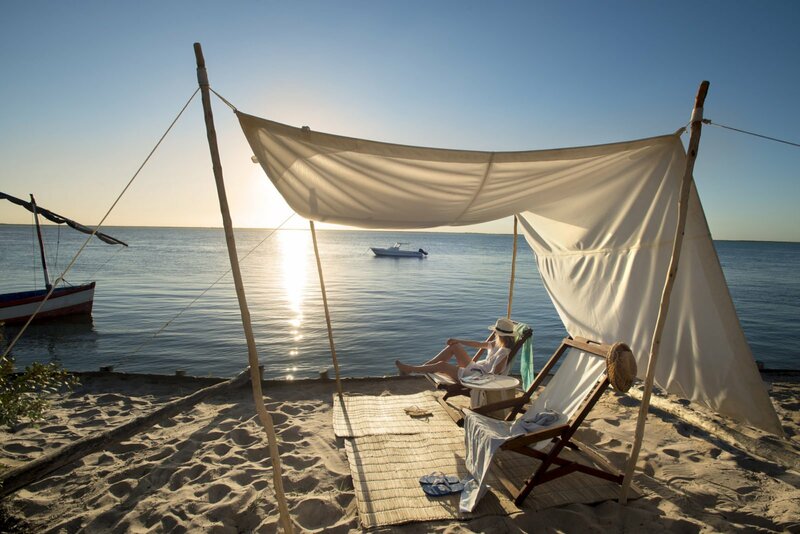 Guests can enjoy a variety of guided excursions and activities, or are free to create their own intimate barefoot experiences and privately explore the area’s natural beauty. 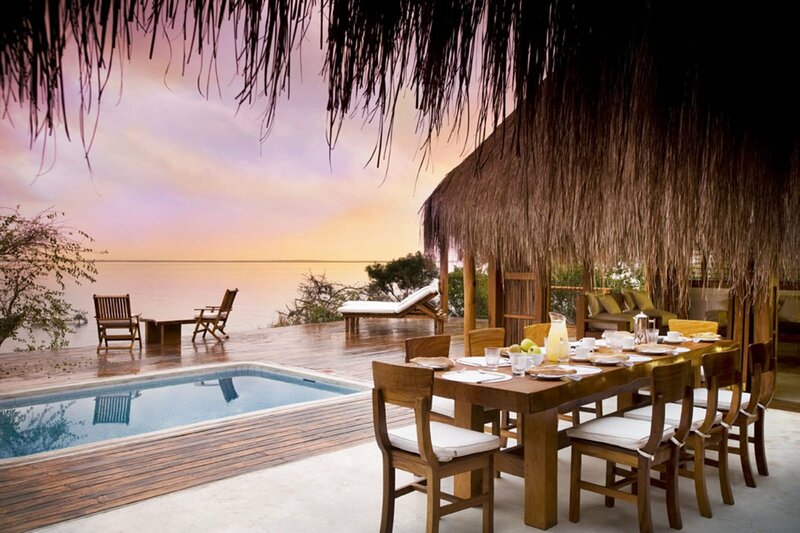 Rio Azul offers serenity in a tropical wilderness both for couples and families alike. 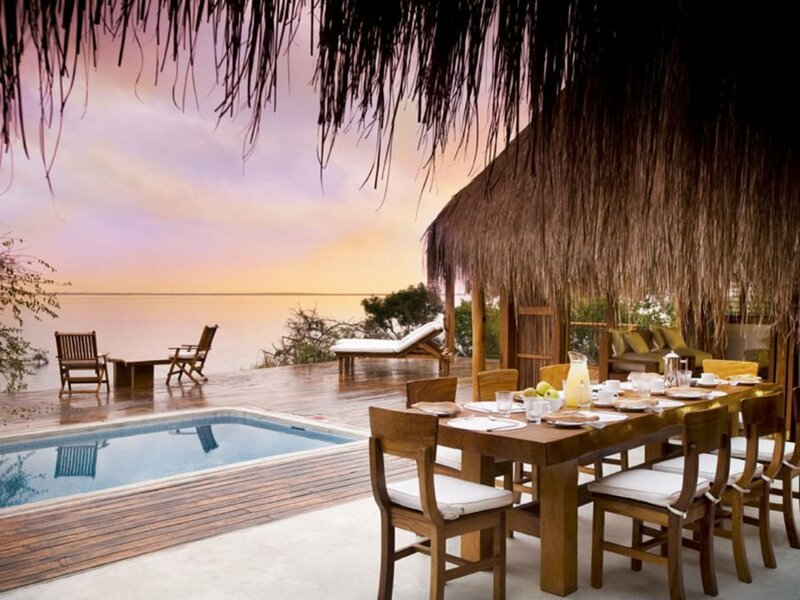 Families can enjoy their own tastefully styled beach villa with a private pool on the deck overlooking the tidal lagoon. 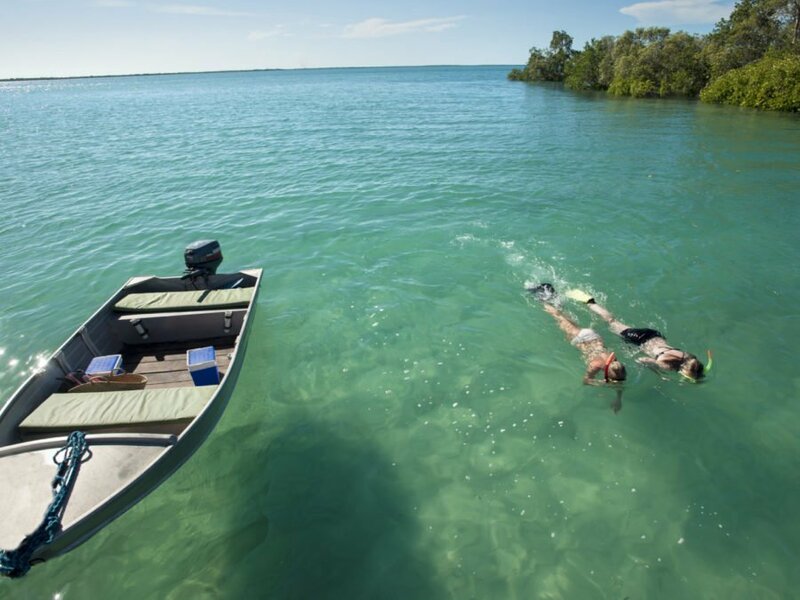 The warm and clear waters of the lagoon invite you and your kids to snorkel, go for long walks around the peninsula or simply take your own private boat out to one of the sand banks. 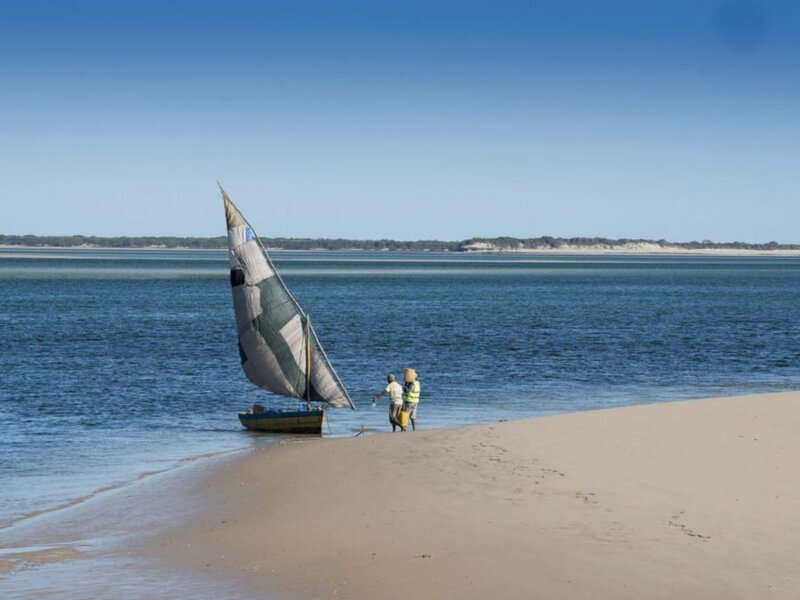 You are encouraged to indulge in a wide range of water and beach activities such as guided lagoon and mangrove forest cruises which offer exceptional birding, as well as boat trips to the Bazaruto Archipelago where you are likely to encounter turtles, dolphins and perhaps even whale sharks. 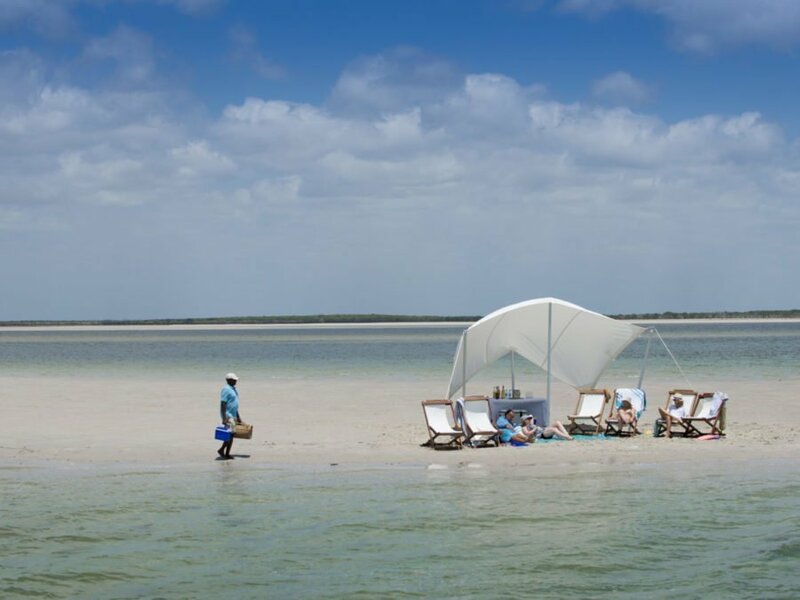 Indulge in a beach picnic where freshly caught fish is cooked on an open fire, or go snorkelling in the mangroves spotting colourful fish hiding in the underwater labyrinth that is a vital natural resource. 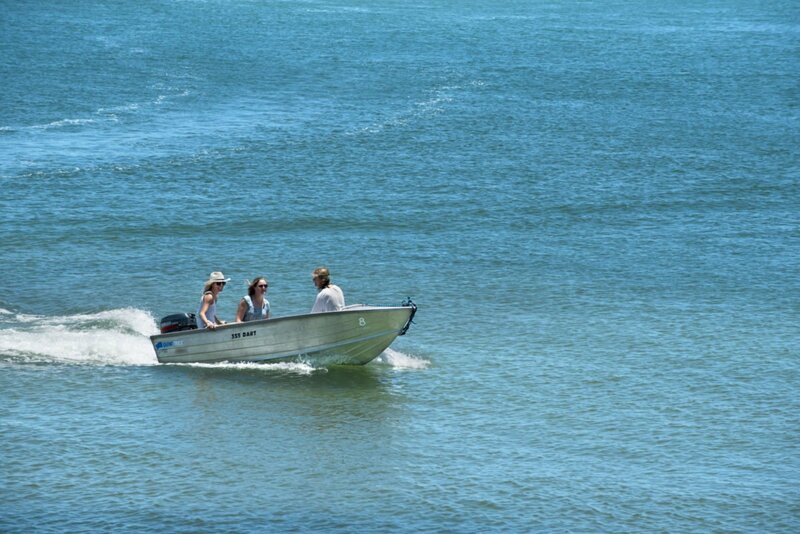 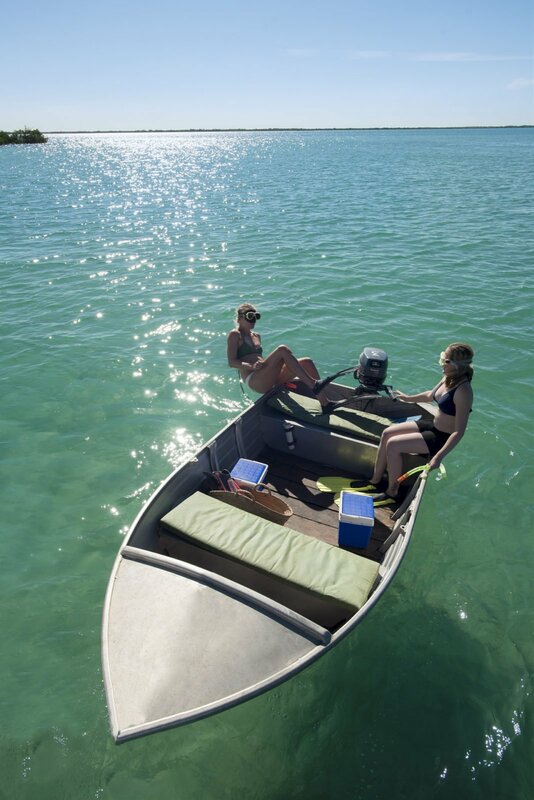 For each couple and family a small private boat is available to explore the blue waters of the lagoon, take a trip to one of the large sand banks at low tide or adventure into the waterways of the estuary. 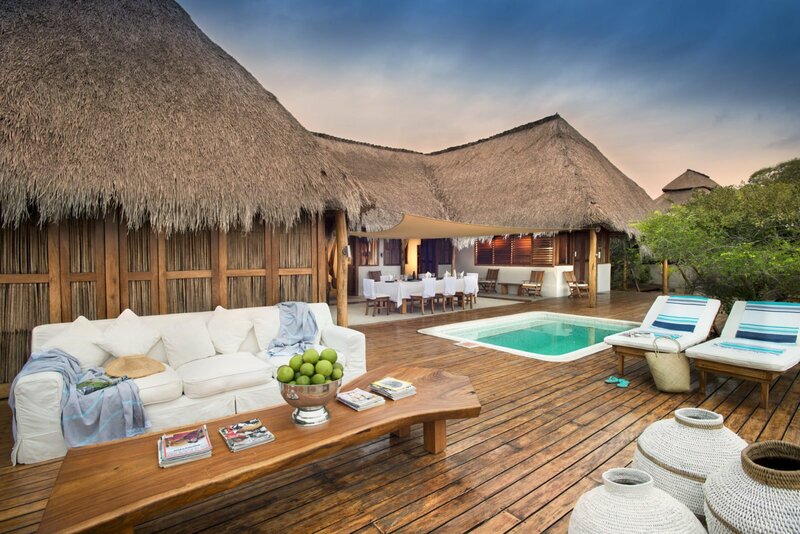 Of course there is always the option to simply relax by the pool or on the deck of your wood and thatch beach chalet. Whatever you choose, be sure to be the creator of your own holiday without compromises. 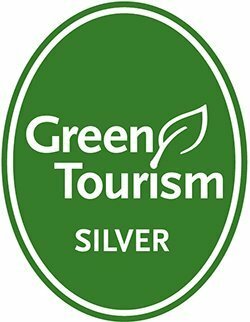 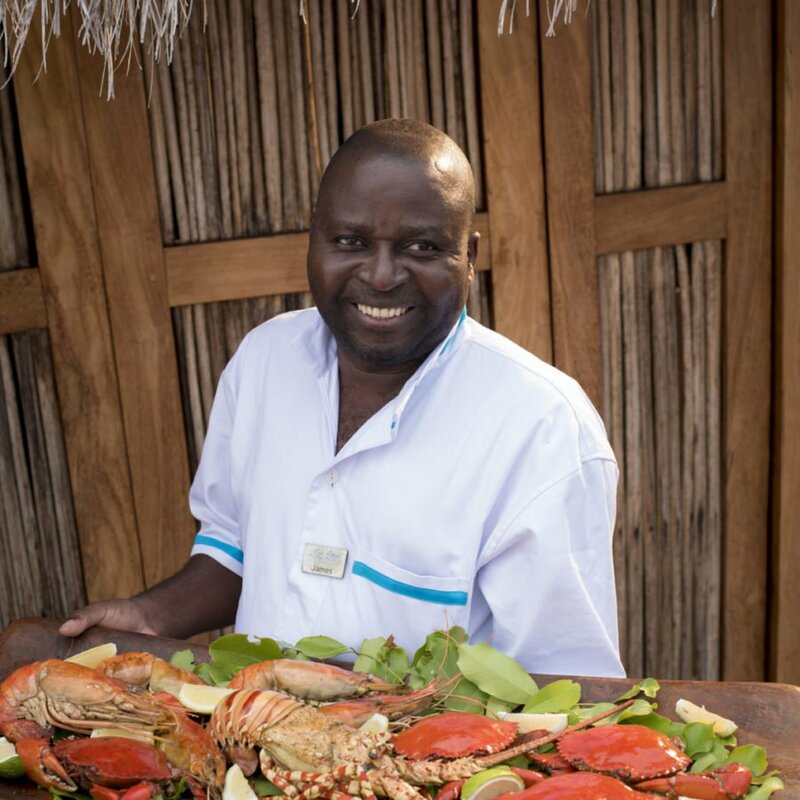 Dining at Rio Azul is a delightful affair with the freshest ingredients locally sourced and produced, or grown in our own vegetable and herb garden, as well as straight from the sea. 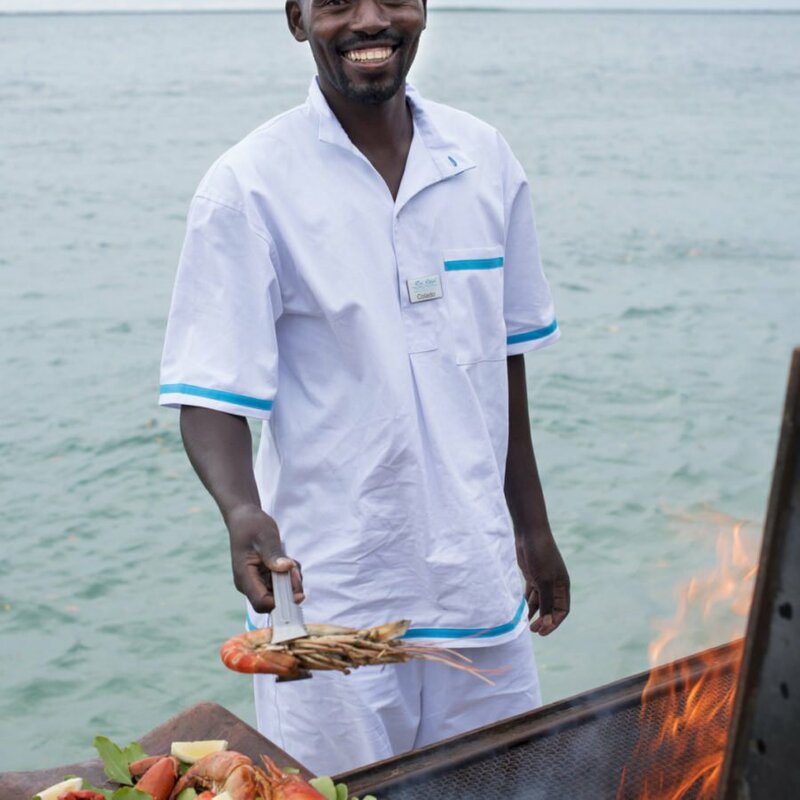 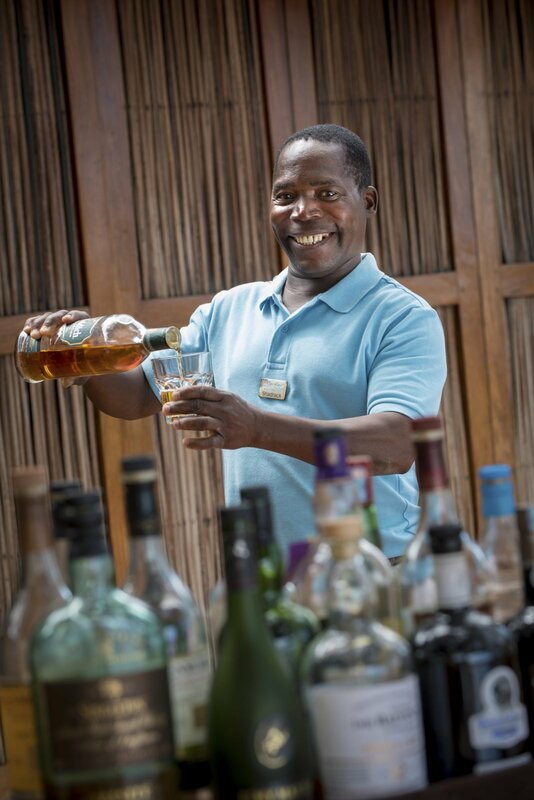 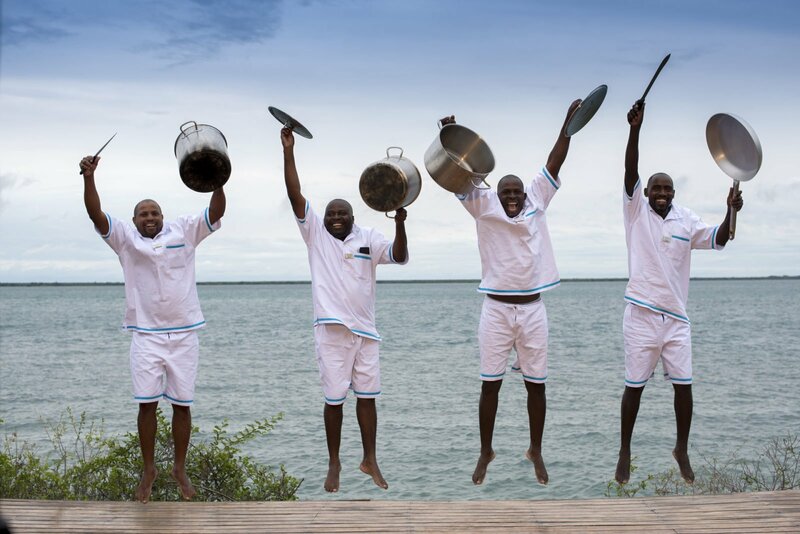 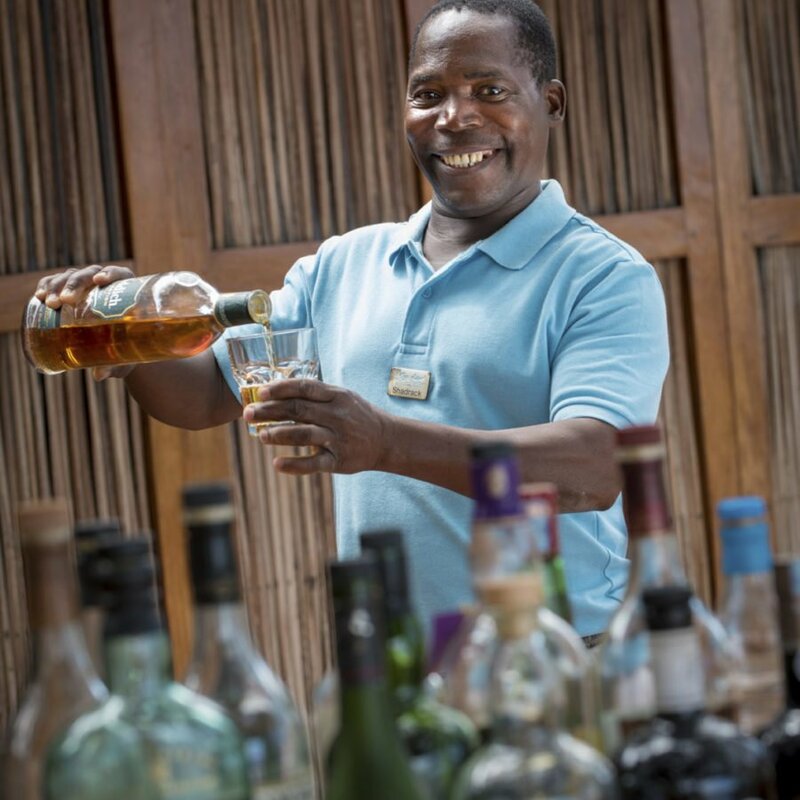 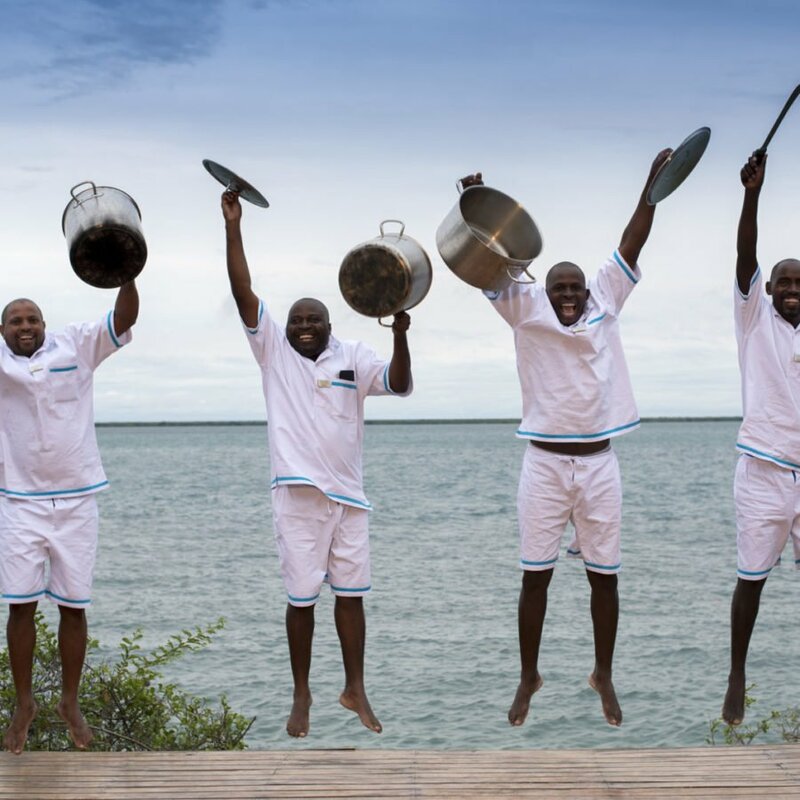 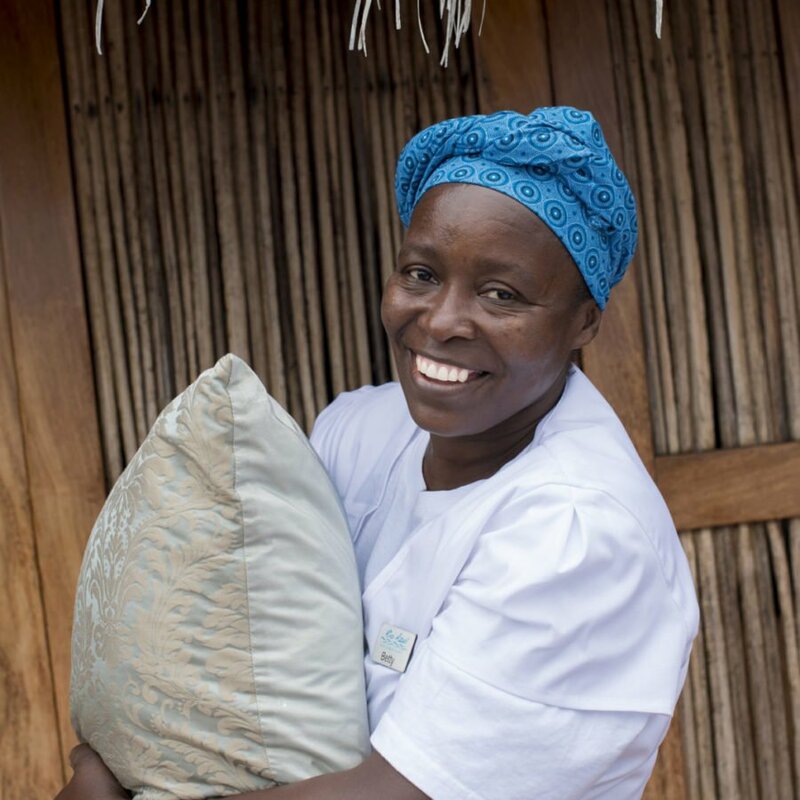 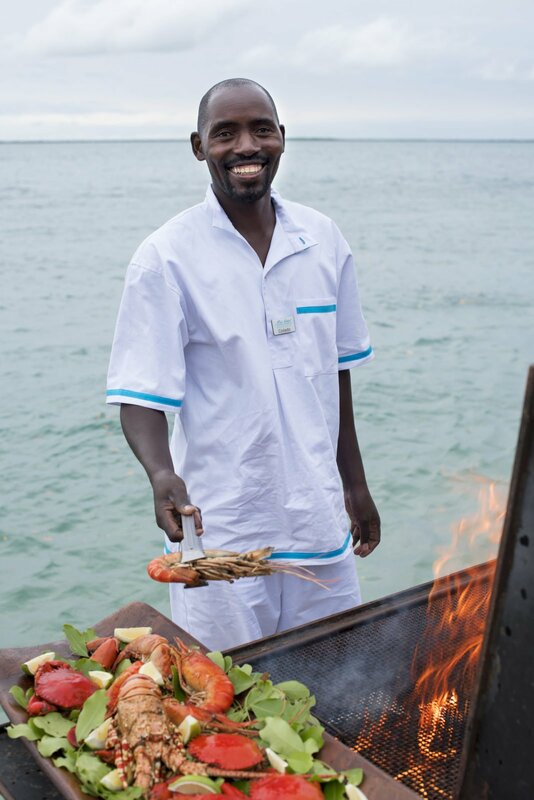 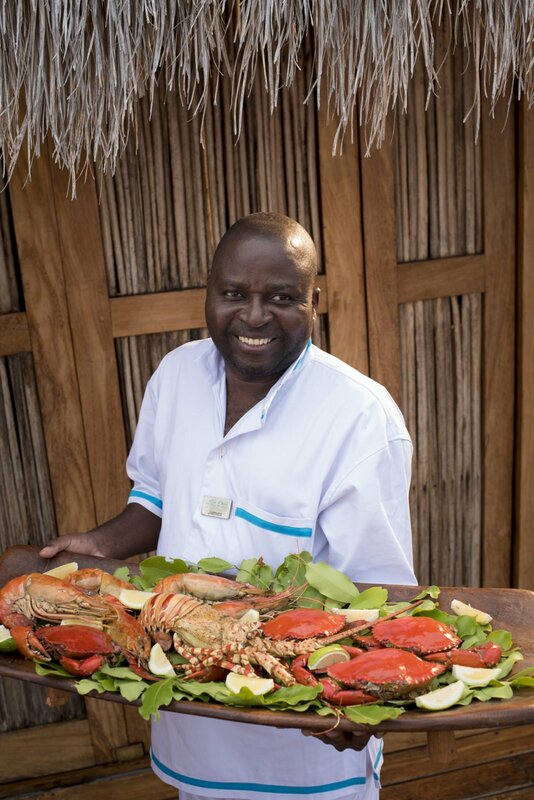 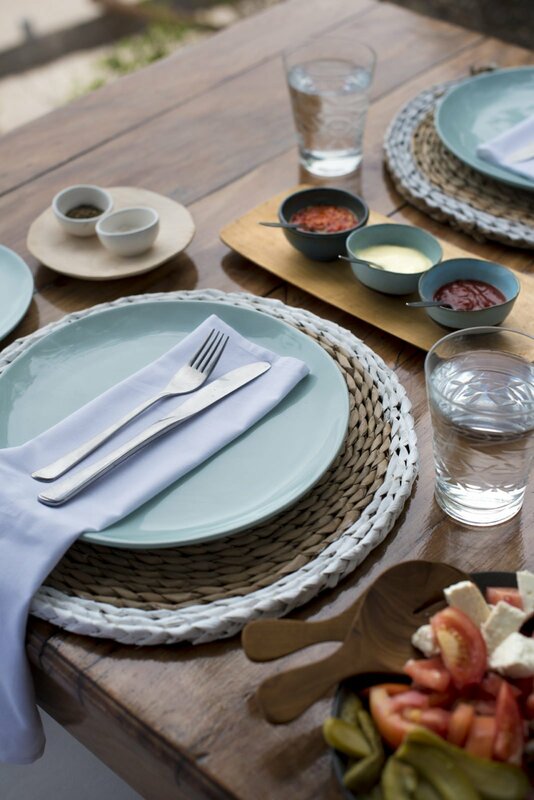 Expect Mozambican specialties such as peri-peri chicken and freshly caught prawns. 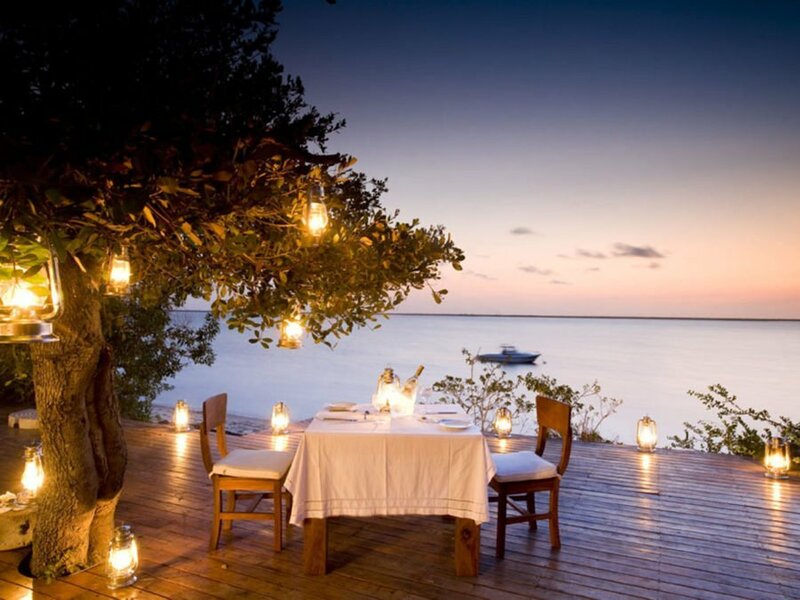 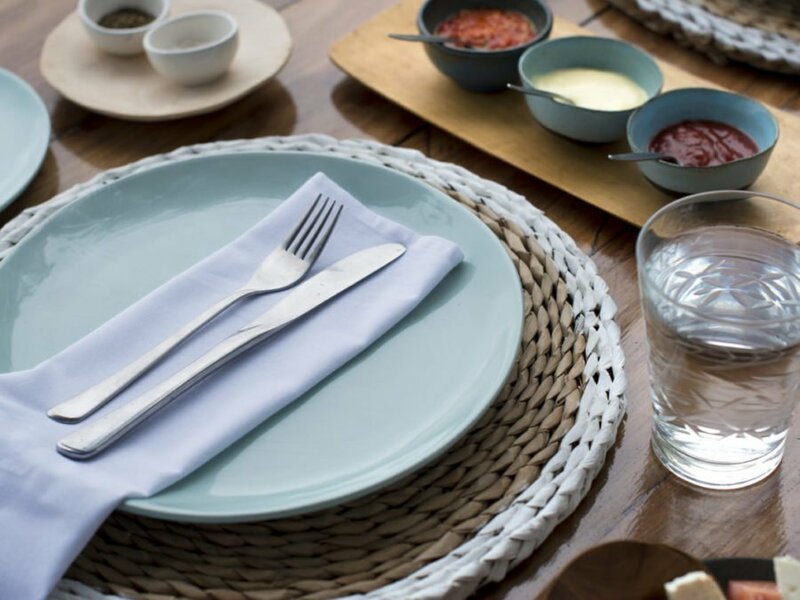 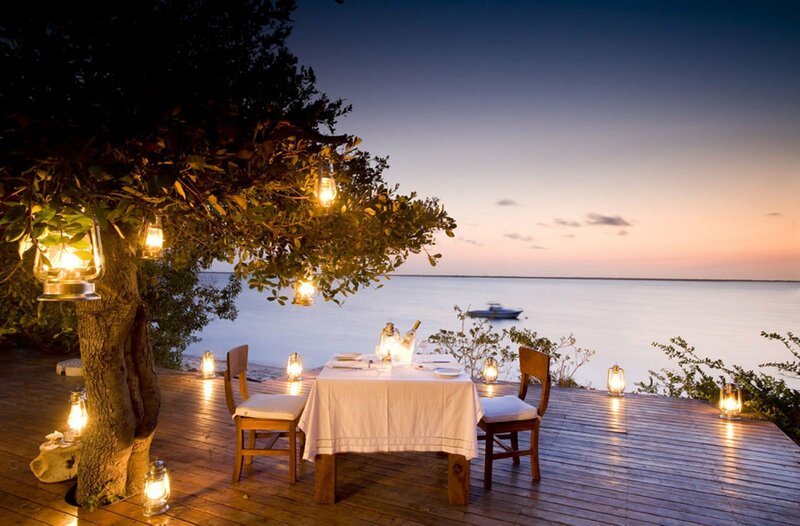 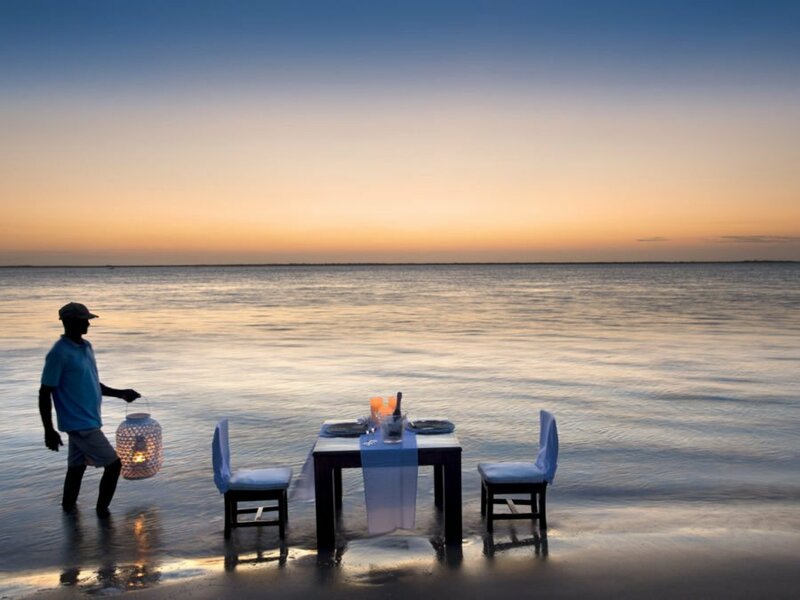 Dinners in particular are always a delightful experience and can vary between relaxed and informal evenings, romantic and candle lit affairs, as well as lively beach BBQs. 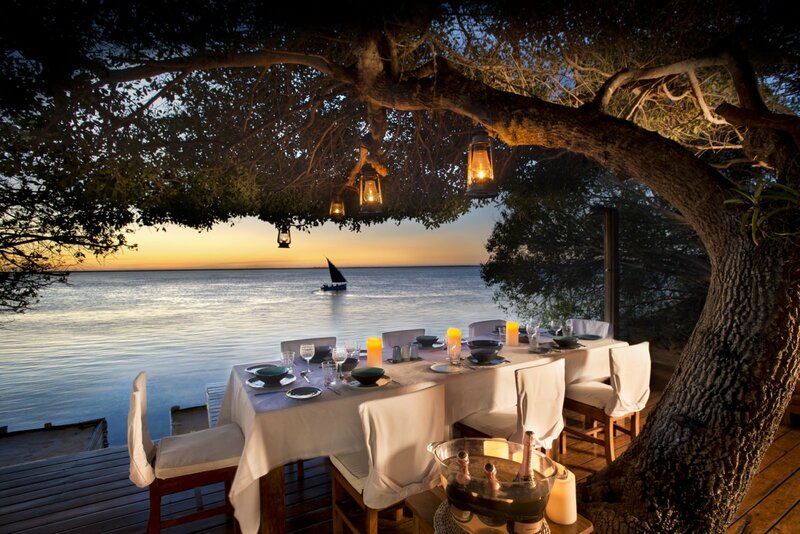 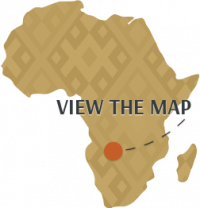 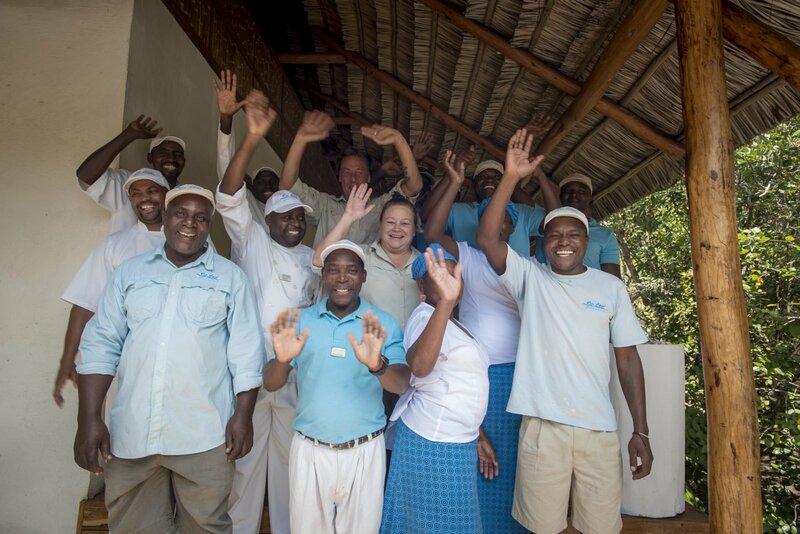 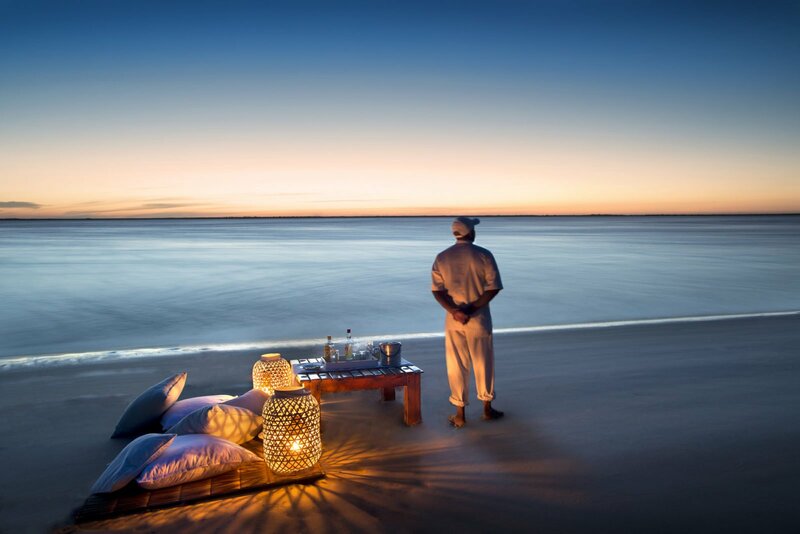 Rio Azul Lodge is just 110 km north of Vilanculos, Mozambique and close to the Bazaruto Archipelago. 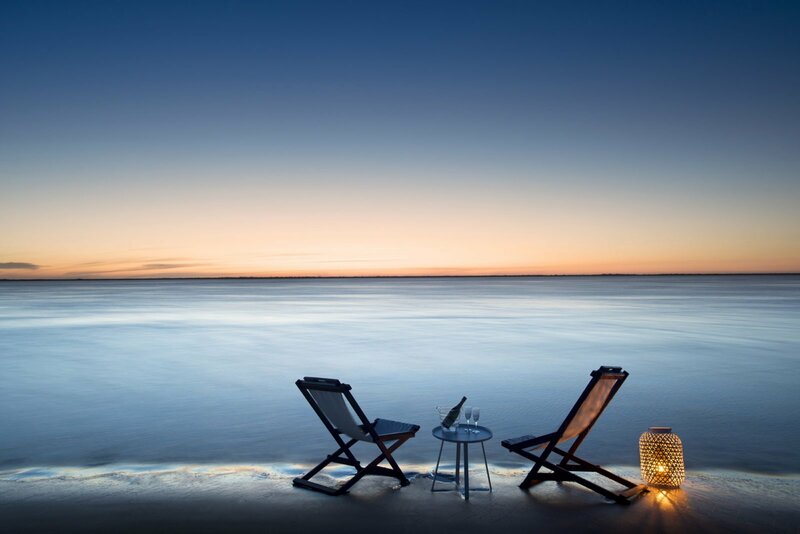 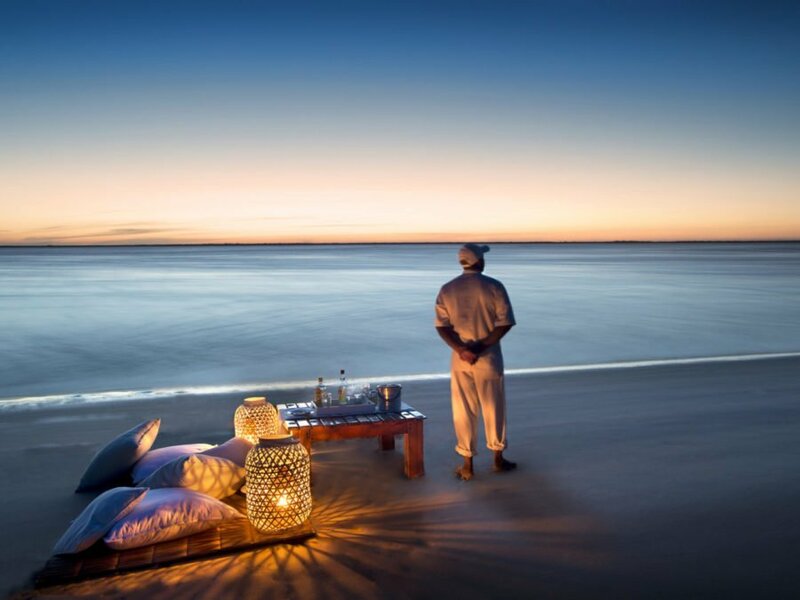 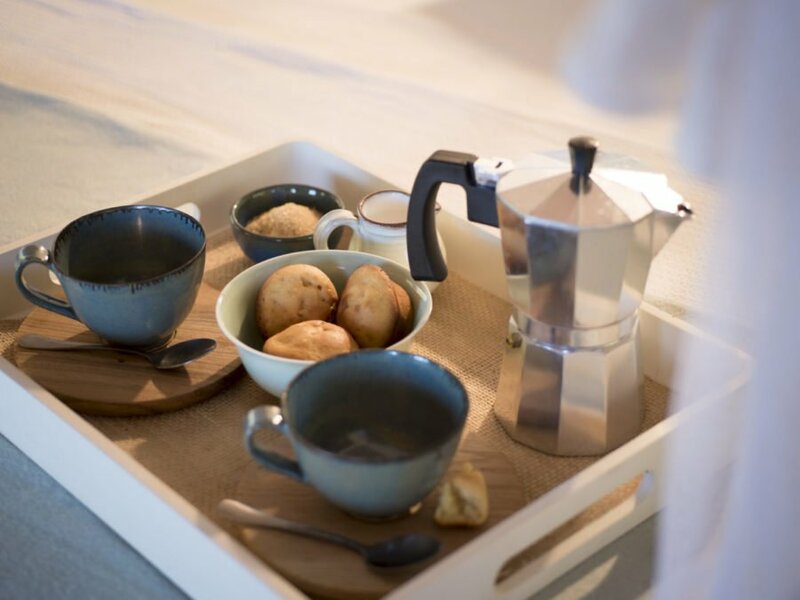 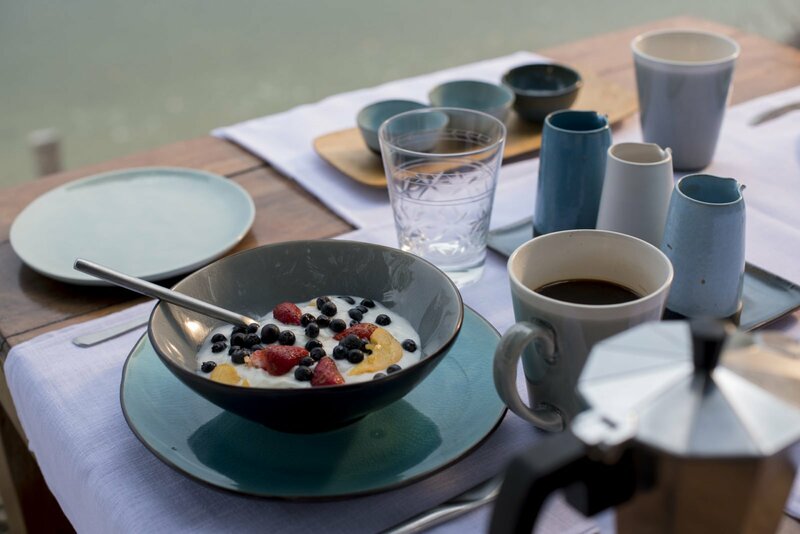 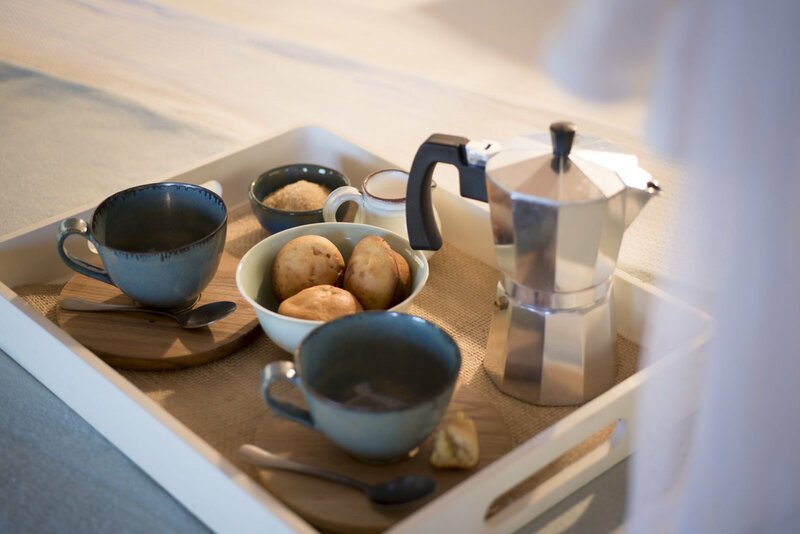 The lodge is advantageously located on a peninsula with the turquoise blue Indian Ocean on one side and a tidal lagoon on the other, allowing you to enjoy spectacular sunsets over water, a rarity in Mozambique. 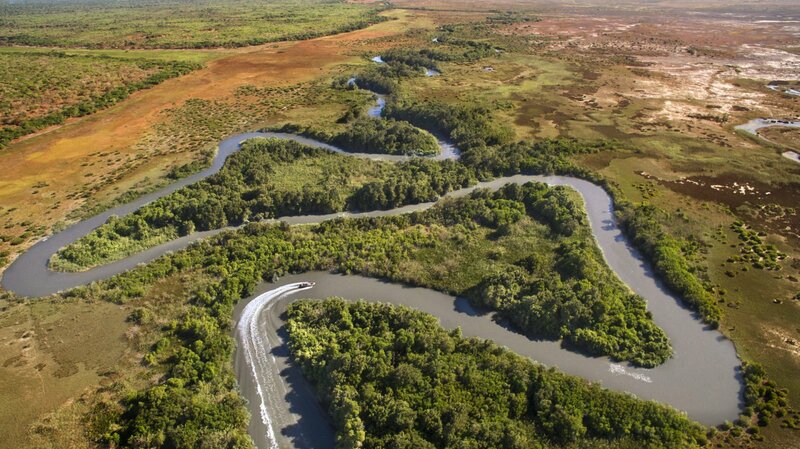 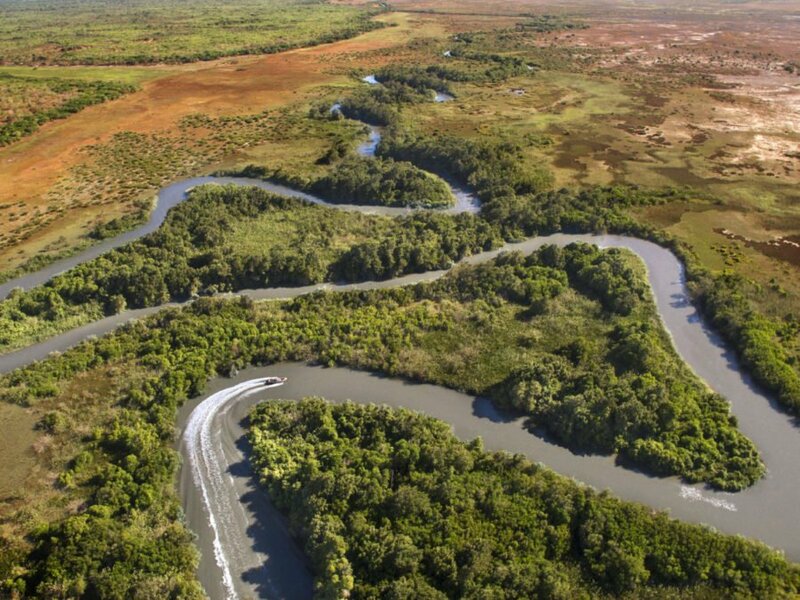 The blue waters are home to an estuary filled with birdlife and fish; the mangrove forest is an important ecological asset that we are dedicated to protecting. 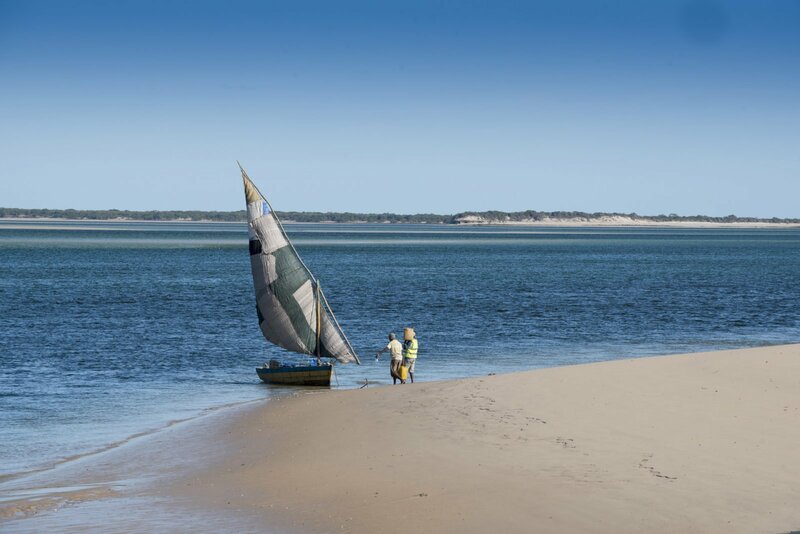 The last stretch of ‘road’ to the lodge is an exhilarating drive on the beach before arriving in a tropical paradise. 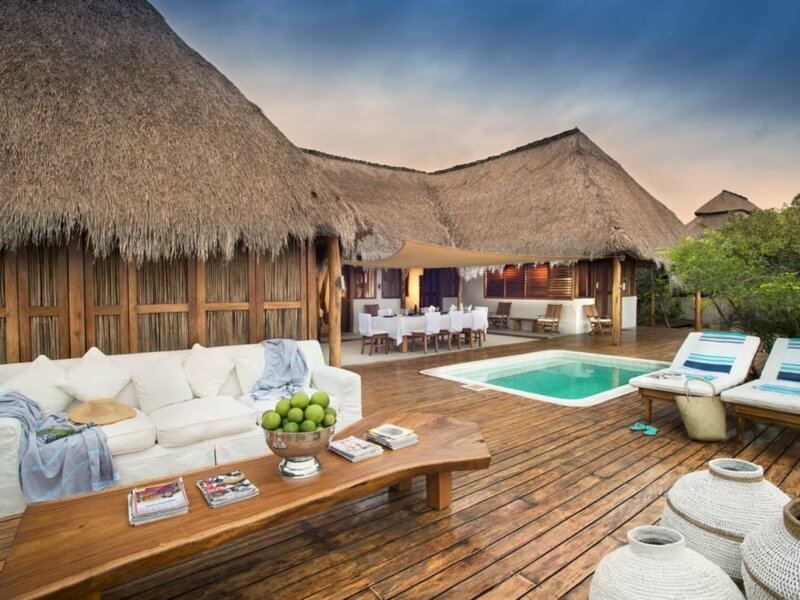 Rio Azul comprises of five elegant, thatched roof, wooden, beach chalets, with sublime views over the lagoon, and two luxury villas also of thatch and wood construction both overlooking the tidal lagoon from a private deck with its own pool. 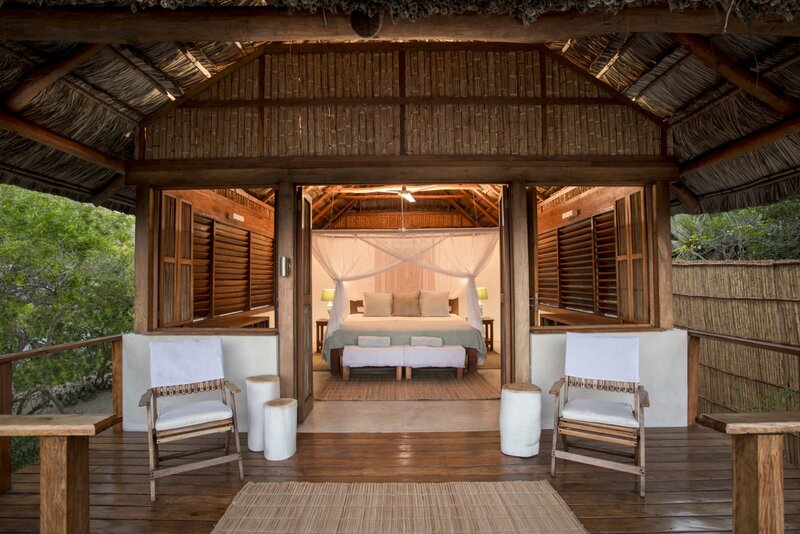 Families and close friends can enjoy a jovial shared holiday in the spacious private villas that both have a private lounge with overhead fans and a full kitchen for private dining. 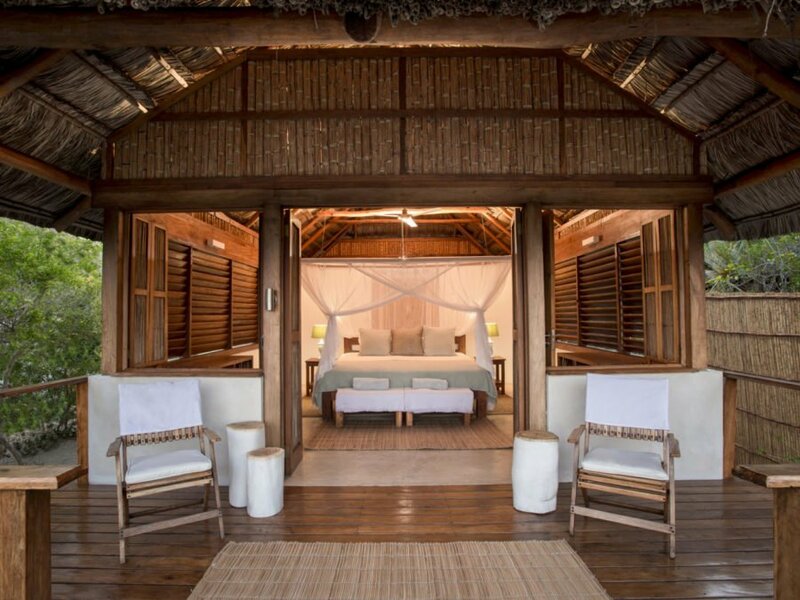 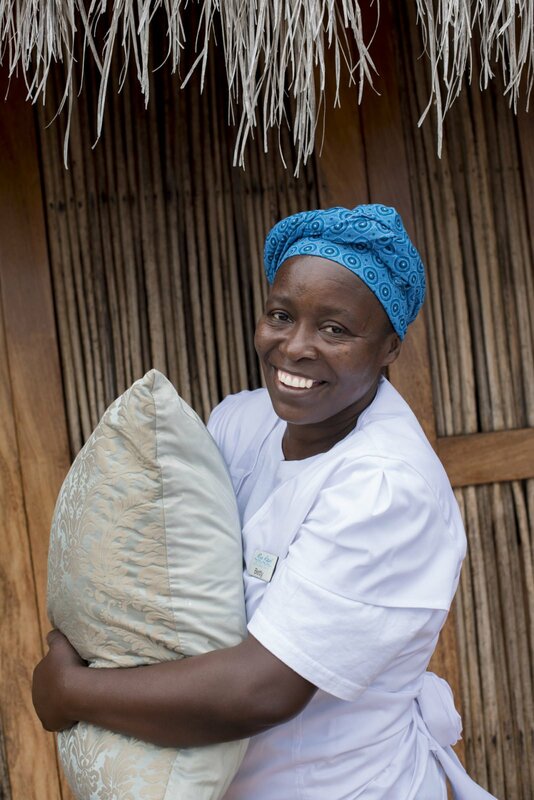 The villa is divided into 3 rooms sleeping 6 adults, which are all en-suite. 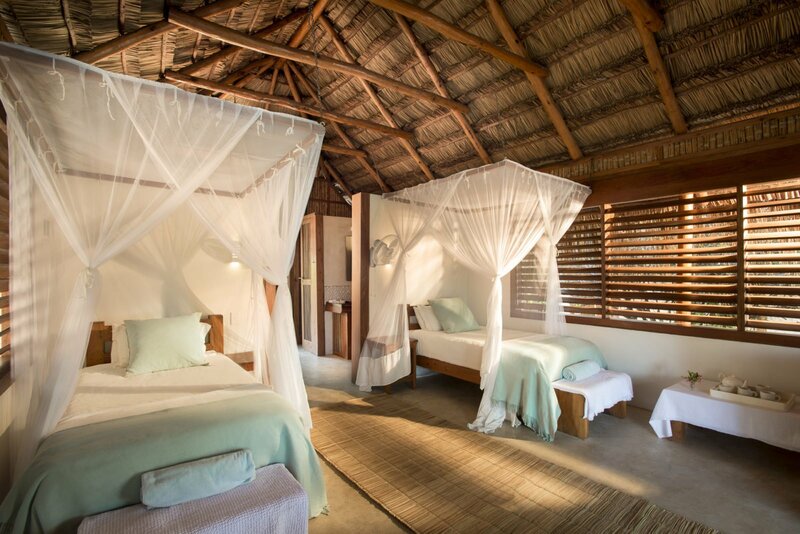 The Villa also has a loft with beds for up to 4 children. 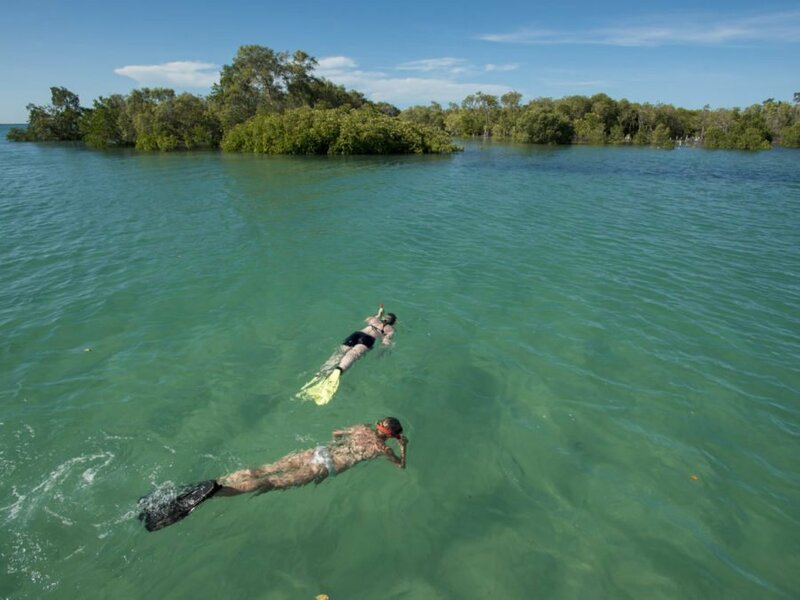 Make use of the lodge’s complimentary snorkelling gear and explore the unique ecosystem of the mangrove forest searching for colourful little fish among the tree roots. 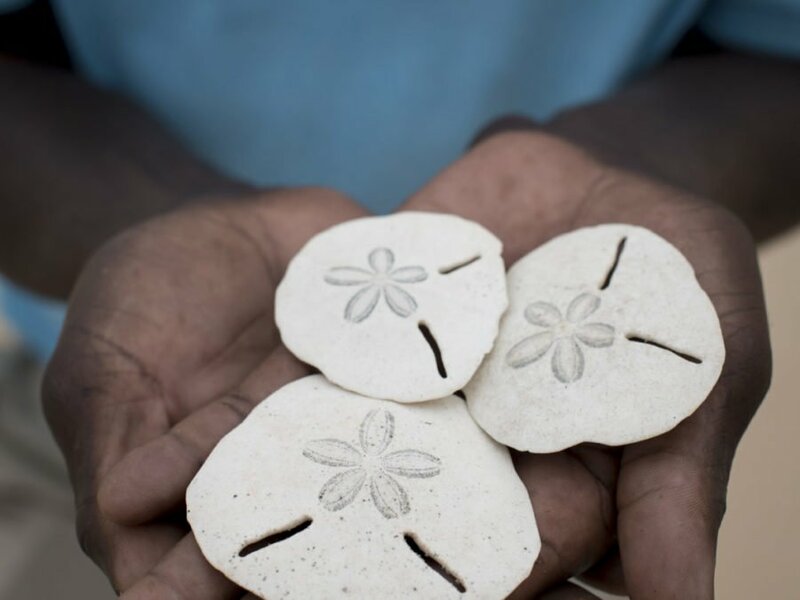 Enjoy a secluded beach picnic on an uninhabited island and look for pretty white Pansy shells that have a distinctive petal-shaped imprint. 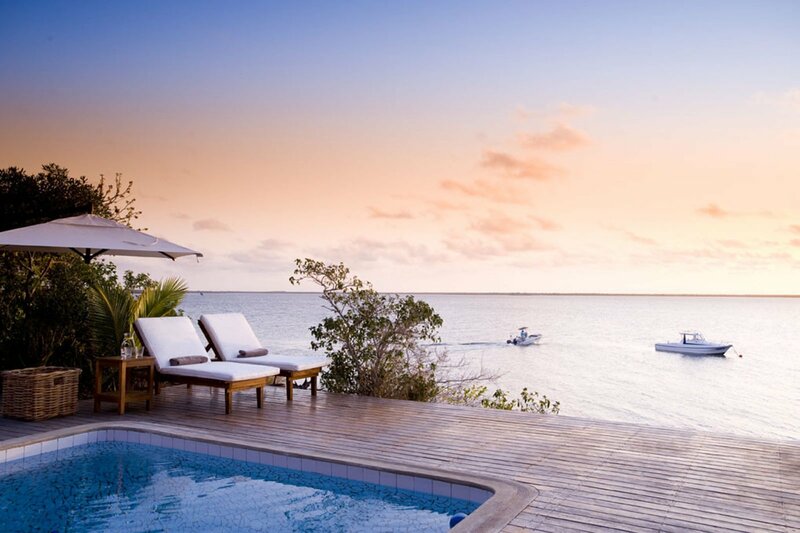 In season, flocks of flamingos add a vivid pink paintbrush to the white and blue surroundings. 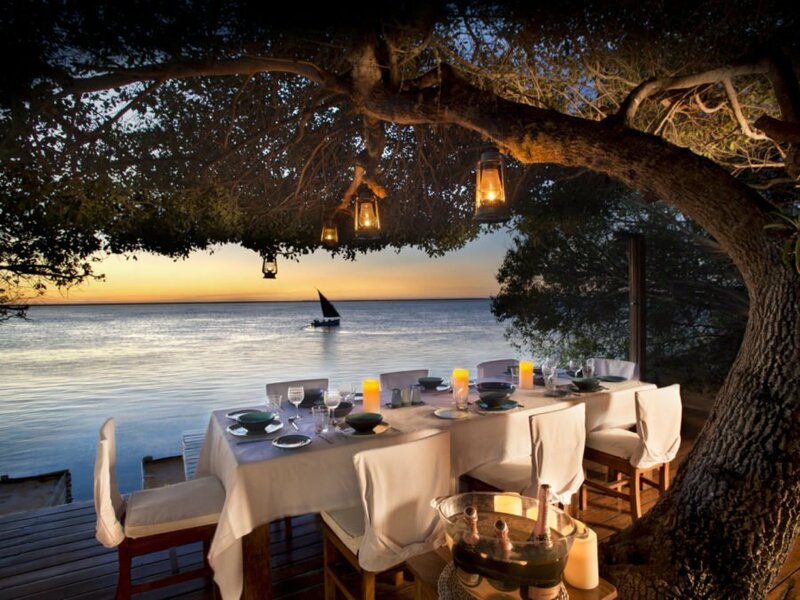 Other birdlife such as is white-breasted cormorants, grey herons, pelicans, and elegant great ibis can be observed as well. 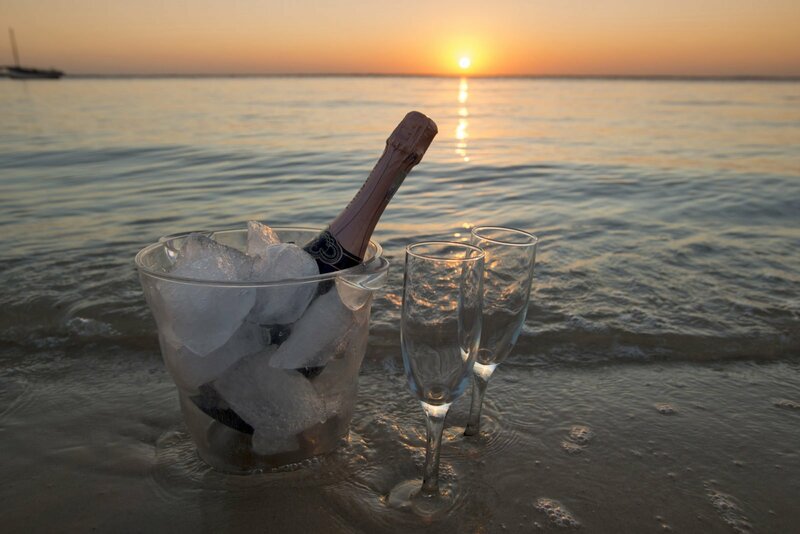 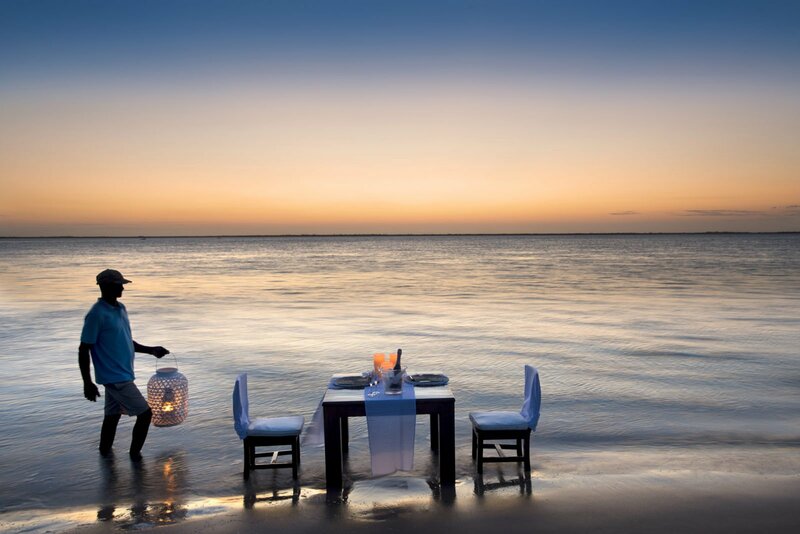 Enjoy a delightful picnic on the beach where everything has been set up for you by our attentive staff. 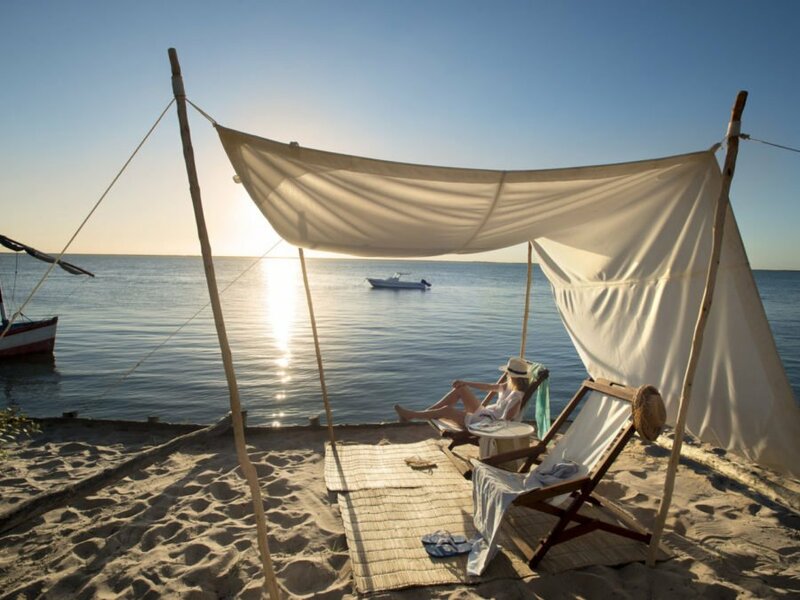 Recline on a comfortable beach chair under shade cover while nibbling on snacks, drinking cool drinks and feasting on freshly caught fish roasted over open coals right on the beach. 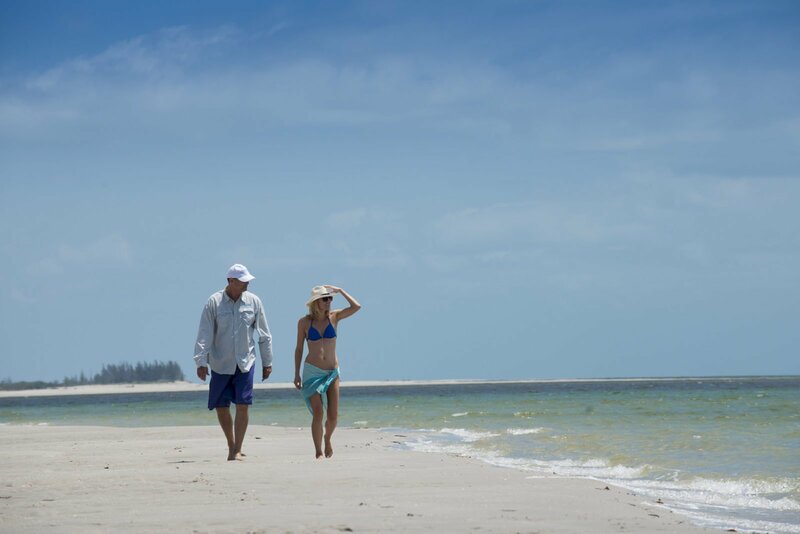 A guided nature walk will allow you to become intimately acquainted with the area’s fauna and flora. 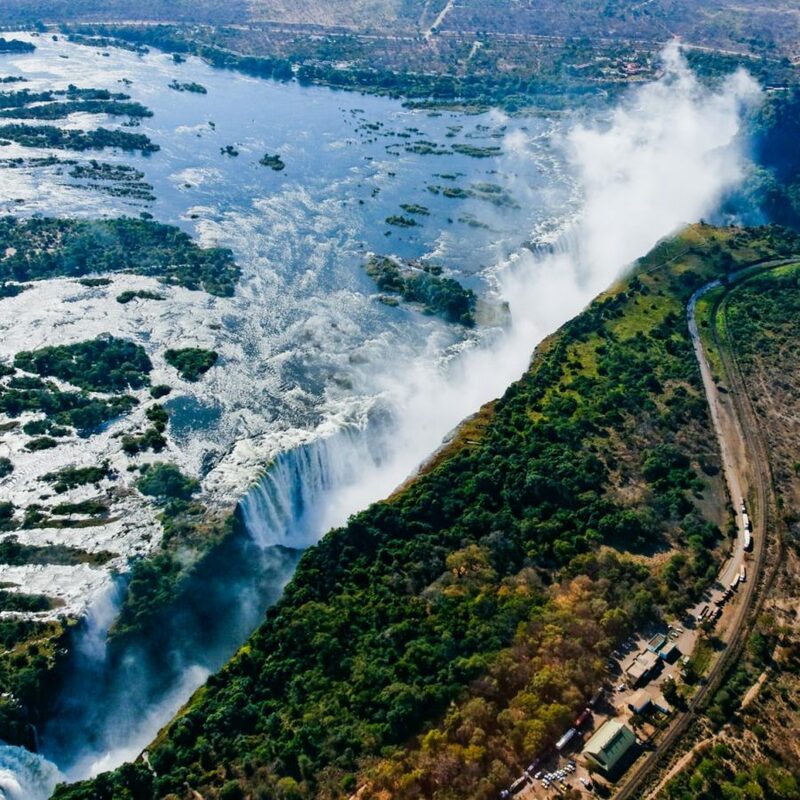 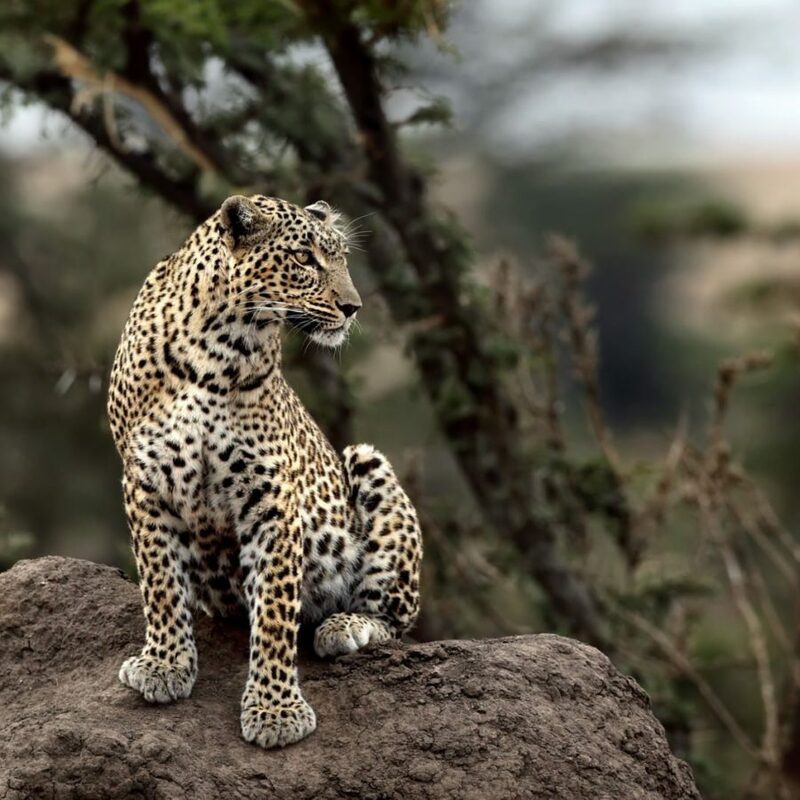 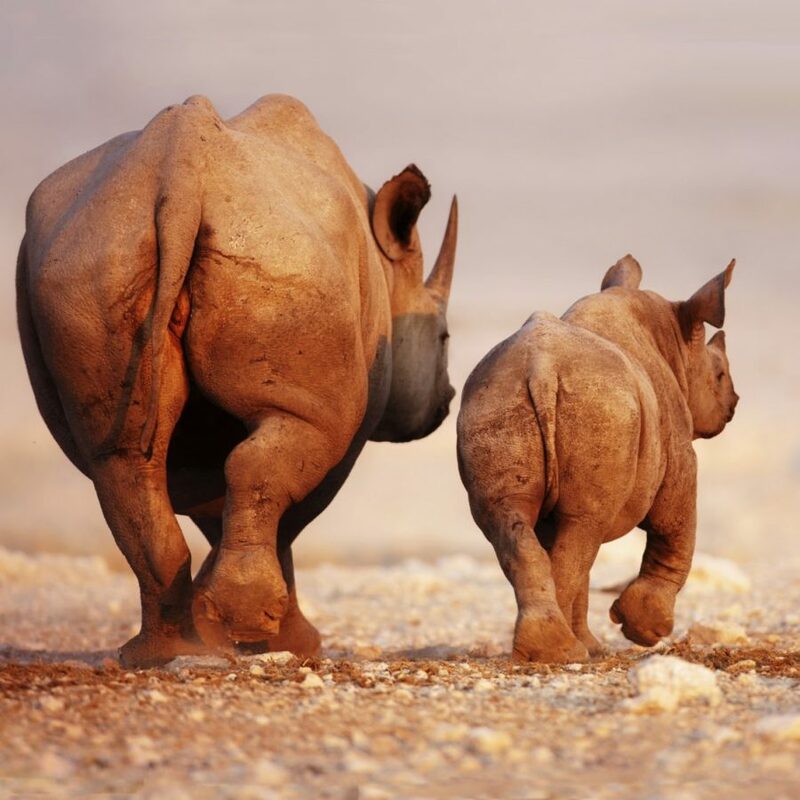 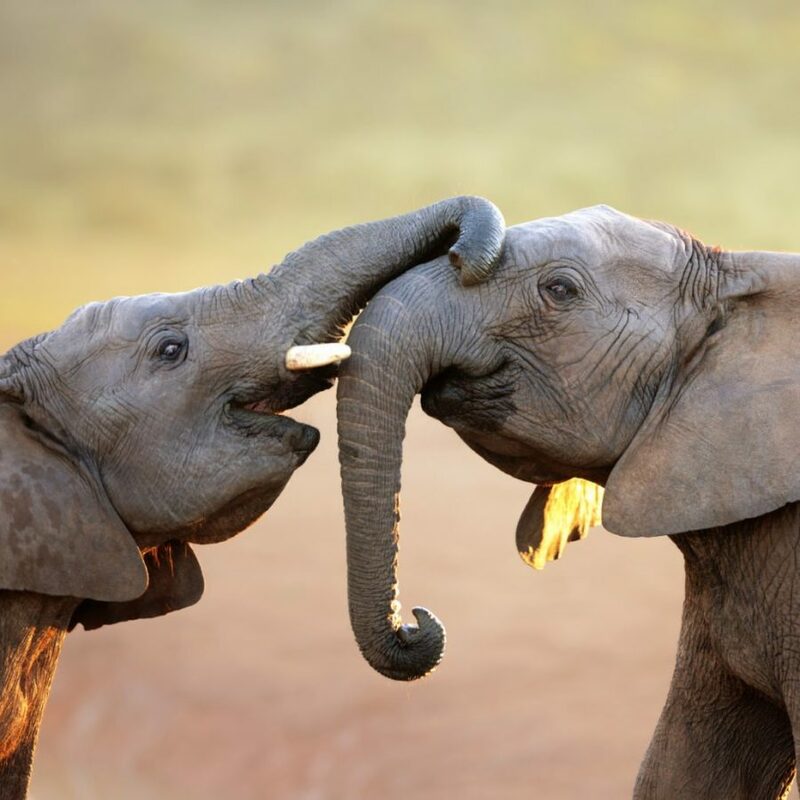 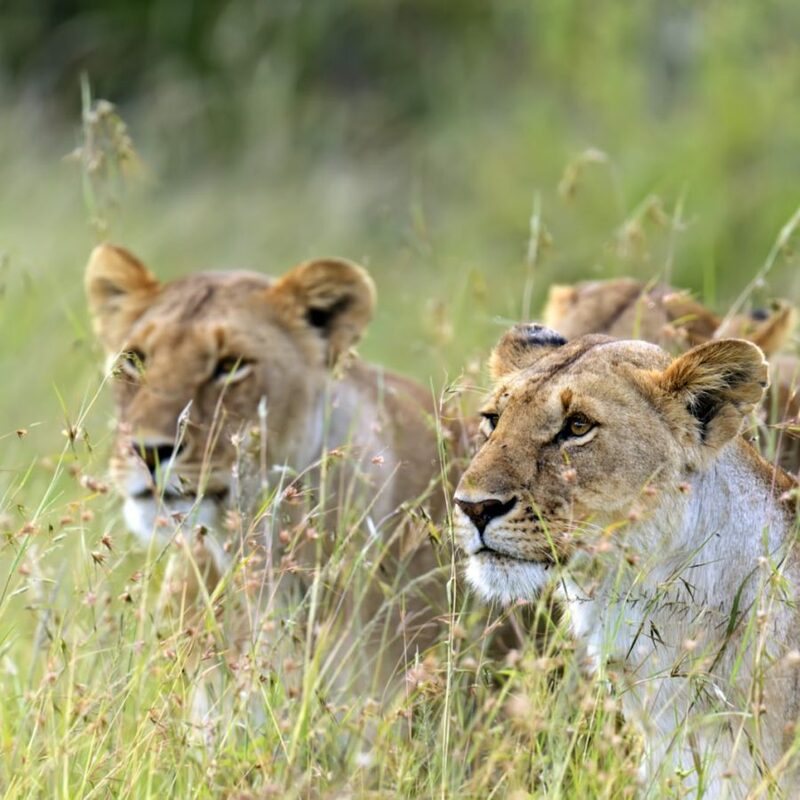 Discover more about the unique ecosystems surrounding the lodge and understand why we are so passionate about protecting them. 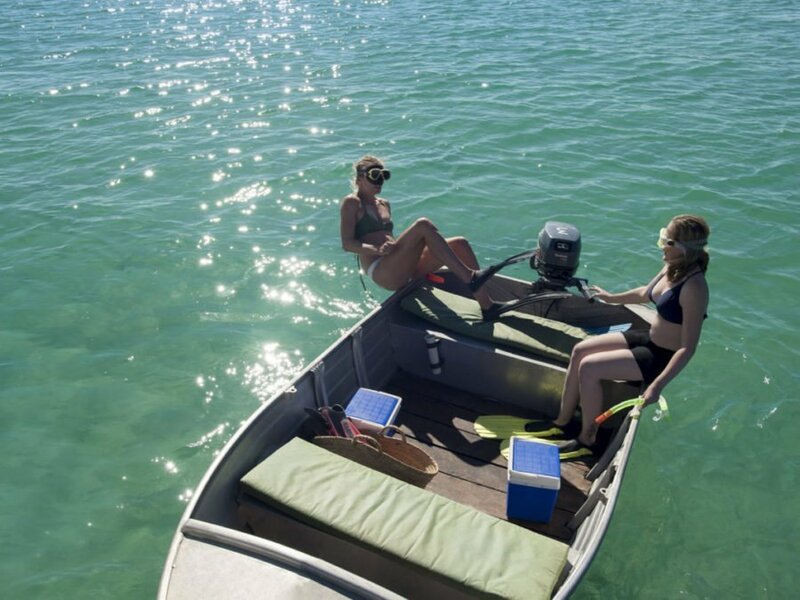 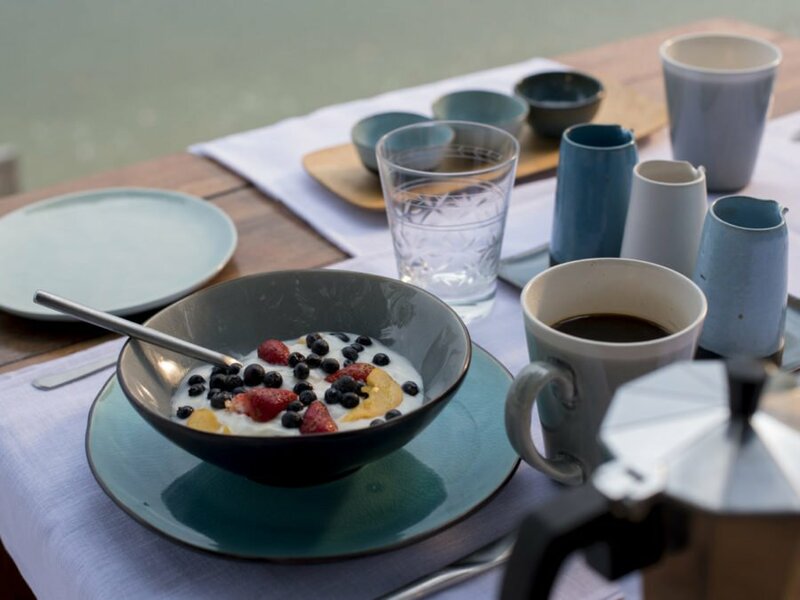 Each chalet has the use of its own “tinnie” boat, a small aluminium alloy boat with 15hp outboard motors that is so easy to use it doesn’t require a boating license. 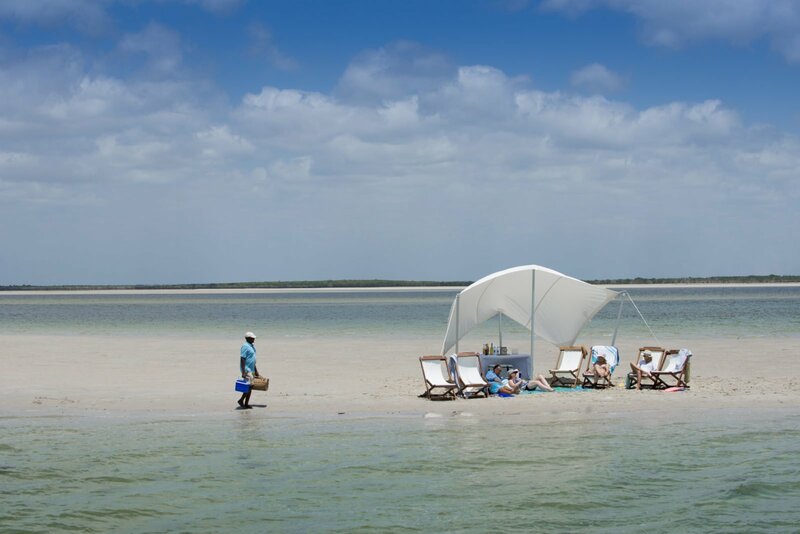 Set out on your very own adventure in the lagoon, take a camera, some binoculars or even snacks and enjoy the freedom. 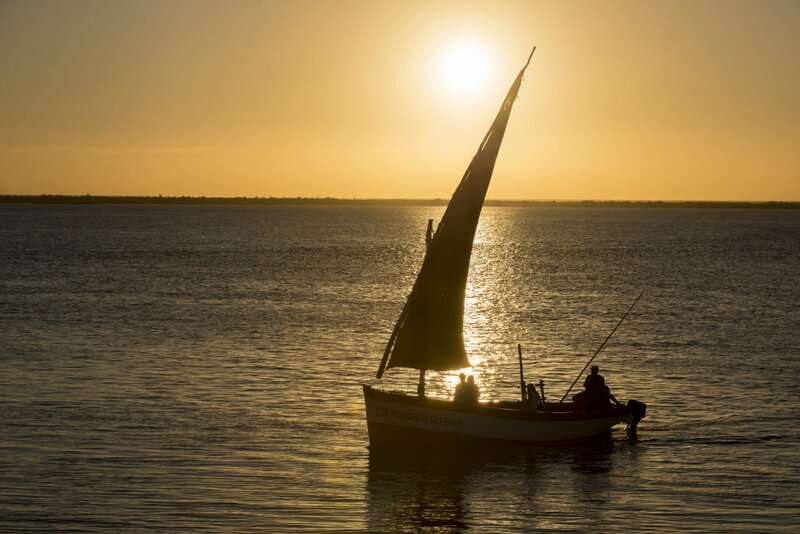 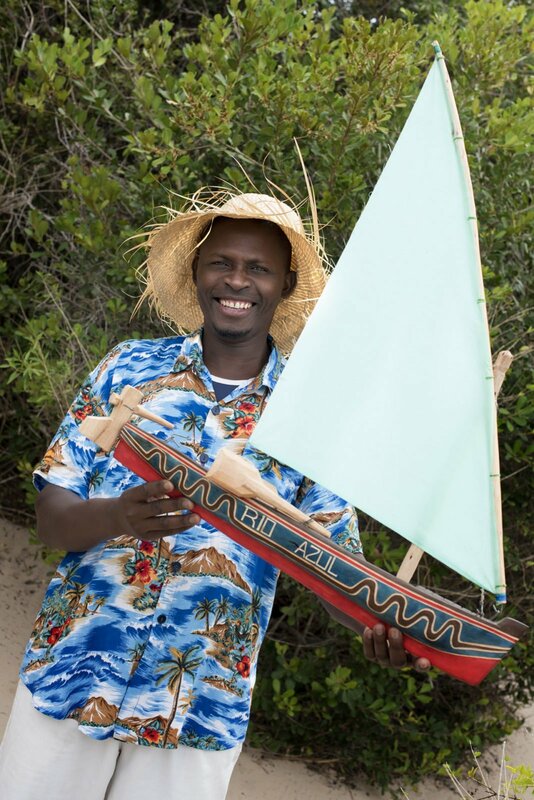 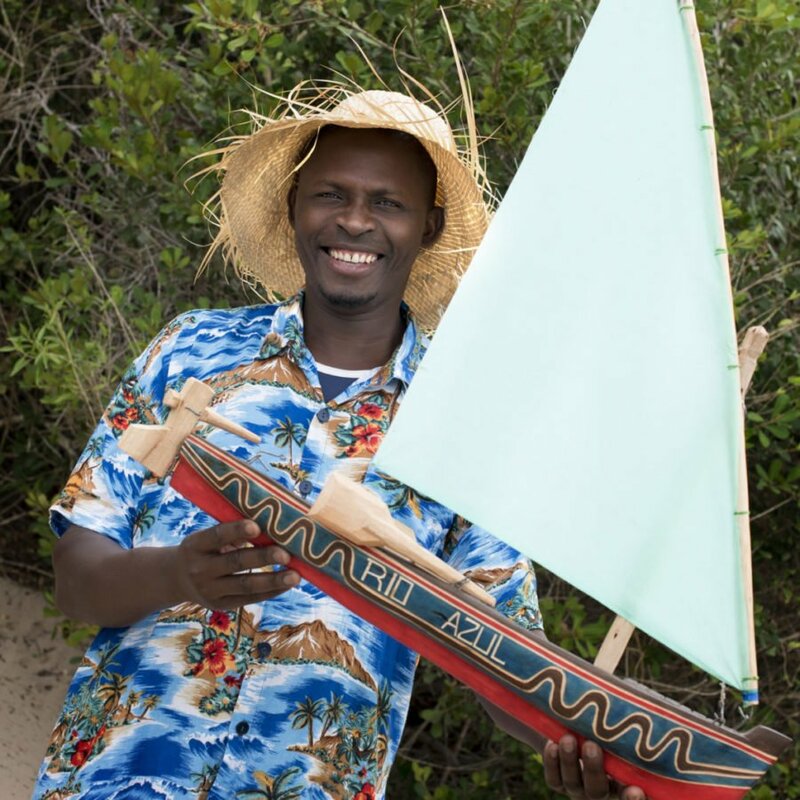 Since 600 AD Mozambicans have been using dhows as transport along the coast. 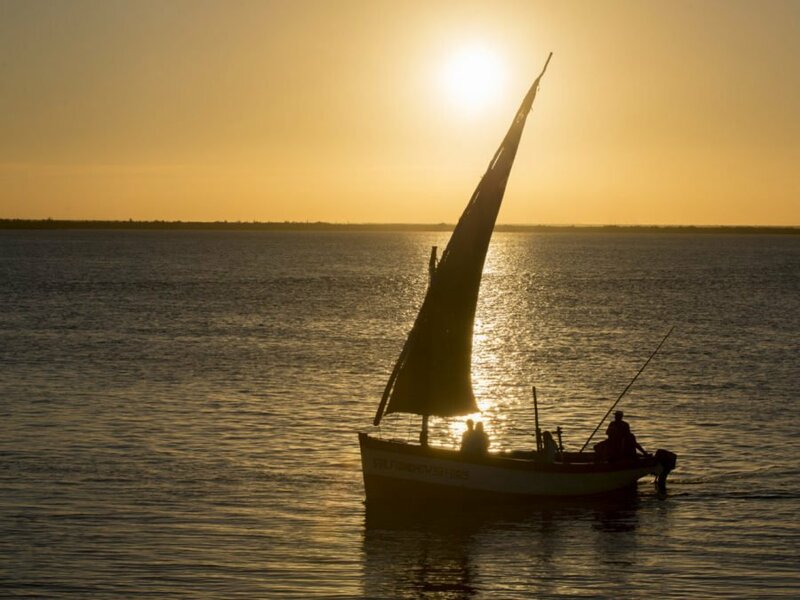 Step back in time on one of these traditional wooden boats with canvas sails and enjoy a magnificent sunset journey on the open seas. 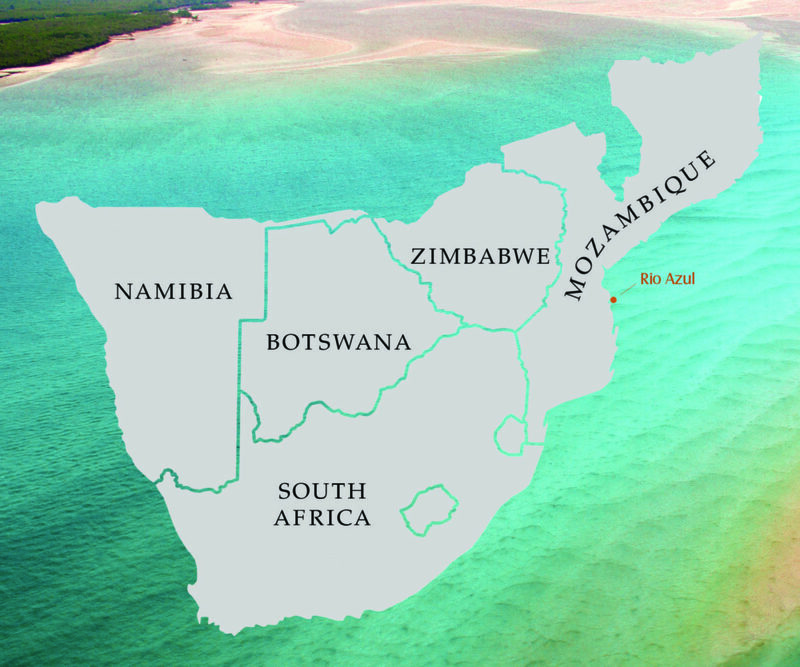 The Bazaruto Archipelago was once peninsula jutting out of Mozambique but now forms six unspoilt islands waiting to be explored. 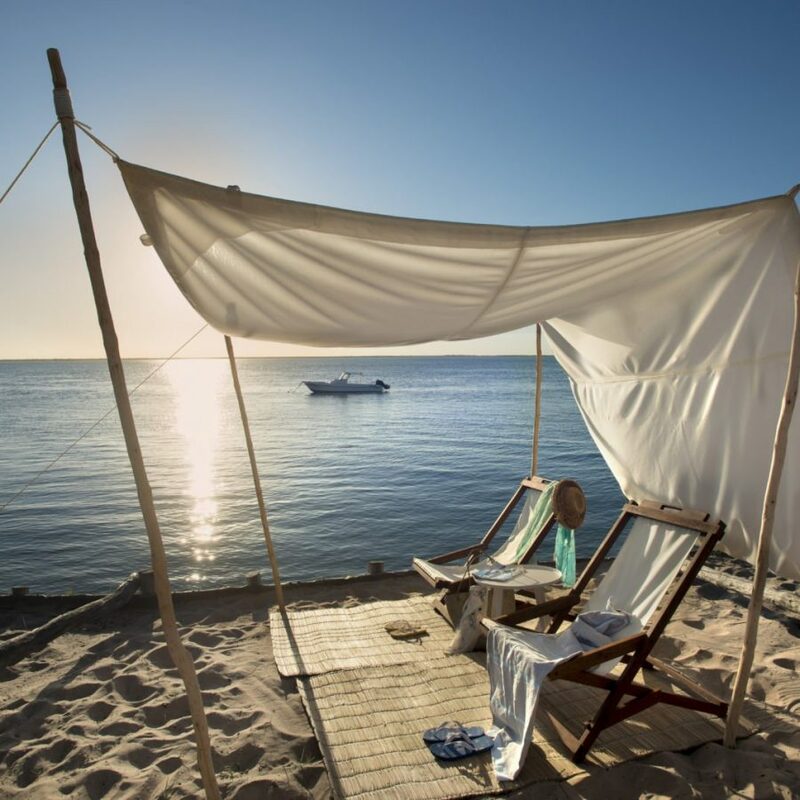 White sand dunes protect the archipelago and form a striking backdrop against the blue sky and azure sea. 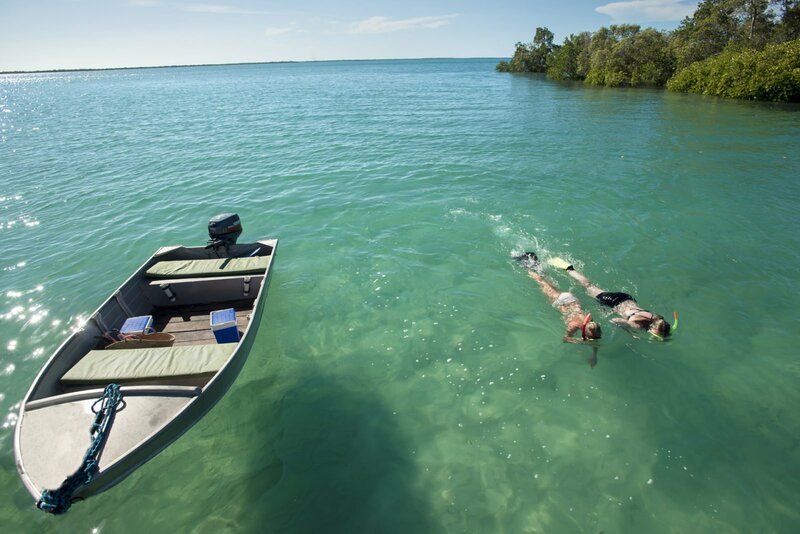 Take a boat trip out into the ocean and snorkel in the open sea where magnificent marine life awaits. 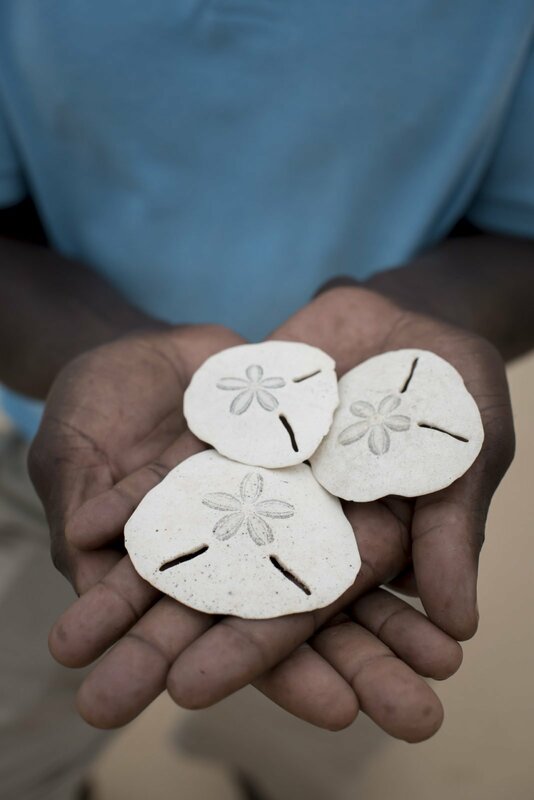 You may even come across a Whale Shark, gentle giants dappled with white spots who call this area their home. 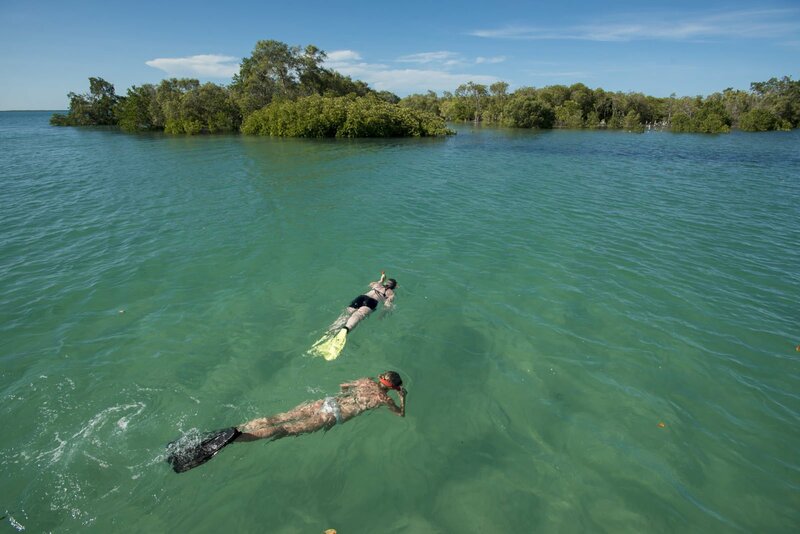 Being surrounded by shoals of fish is another fantastic experience that is not to be missed. 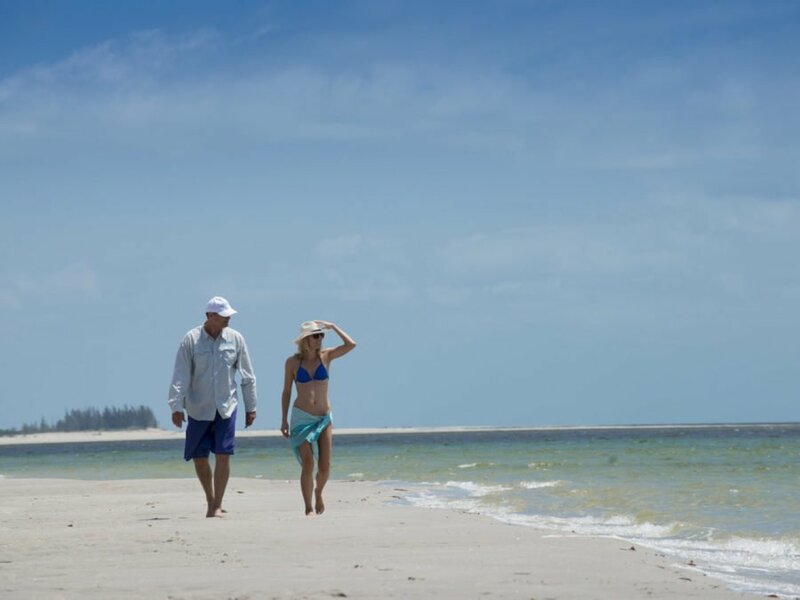 Experienced and qualified guides know the area intimately and take guests out to a nearby reef where they have the option of trolling, plugging, jigging, fly-fishing or drift bait fishing for game fish. 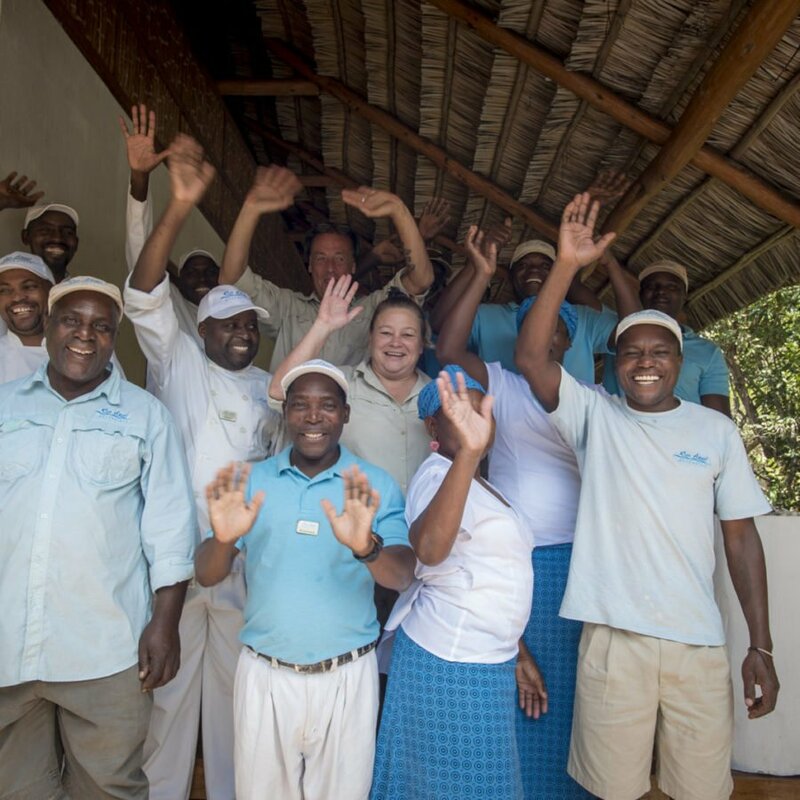 The lodge operates on a strict catch and release policy.